Tanzania’s geology is dominated by an Archean Craton. Progressively younger crystalline rocks rim this granitic nucleus with sediments and volcanics of Paleozoic to Recent age occupying the rifted grabens, coastal plains and inland basins; Karoo sequences are present in structural basins. Rocks of Archean, Proterozoic, Paleozoic, Mesozoic and Cenozoic age are all well represented. Much of Northern and Central Tanzania is underlain by Archean crust; the central part is dominated by high grade paragneiss and granitic migmatites of the Dodoman Supergroup while the northern part corresponds to the Greenstone Belt comprising the Nyanzian Supergroup and in the extreme north the Kavirondian Supergroup. The Nyanzian Supergroup comprises sequences of dominantly mafic volcanics and immature sediments, including chert/banded iron formation units, that host the majority of Tanzania’s gold deposits. The Craton also hosts major diamondiferous kimberlites including the world class Mwadui pipe; it is surrounded to the SE and SW by the Paleo-Proterozoic Usagaran and Ubendian mobile belts respectively comprising high grade crystalline metamorphics with a number of post-orogenic intrusives hosting base metals, shear hosted gold and various types of gemstones. The Palaeozoic-Mesozoic Karoo Supergroup reaches its northern limit in Tanzania consisting of mainly of continental sediments with high-quality coal resources. Proven natural gas reserves are 6513 billion m3. Tanzania in 2011 was the 4th largest gold producer in Africa after South Africa, Ghana and Mali. Gold production stood at roughly 40 tons a year, copper at 2,980 tons, silver at 10 tons and diamond at 11,2670 carats. The Business Monitor International (BMI) forecasts average annual growth in the sector of 7.7% between 2011 and 2015. BMI also predict a doubling in value of the sector between 2010 and 2015, from $0.64bn to $1.28bn. Minerals that have been identified in Tanzania include gold, iron ore, nickel, copper, cobalt, silver, diamond, tanzanite, ruby, garnet, limestone, soda ash, gypsum, salt, phosphate, coal, uranium, gravel, sand and dimension stones. The earliest organized prospecting and mining in Tanzania took place during the German colonial period, beginning with gold discoveries in the Lake Victoria region in 1894. Mining began at the Sekenke Mine in 1909. After 1930, gold production was substantial and increased steadily until World War II. By 1967, the gold industry had declined to insignificance, only to revive after 1974-75 when the world gold price increased greatly. Beginning in April 1990, the Bank of Tanzania began buying gold at the world market price through commercial banks, paying miners in Tanzanian shillings calculated at the parallel-market rate for the US dollar rather than at the official rate. Diamond mining, which had been relatively minor prior to 1940, received a major boost with discovery of the Mwadui Mine in 1940. Besides gold and diamonds, which have long been the mainstays of mineral production, mining of other commodities has been relatively modest, namely for copper, lead, phosphate, coal, kaolin and gemstones. In the late 1980's, the government attempted to capture the revenues being generated from gem mining by licensing private companies to buy, cut and export gemstones being produced by small-scale miners. Coloured gemstones (excluding diamonds) are an increasingly important mineral product. In 1989, small miners produced about 10 tonnes of precious and semi-precious stones. Tanzania's most famous gem is tanzanite, a sapphire-coloured variety of zoisite discovered in 1967. Other important gemstones are ruby, sapphire, emerald, garnets and lesser quantities of zircon, tourmaline and other minerals. In the late 1990's, several mining companies from Canada, United Kingdom, Australia and South Africa arrived in Tanzania, interested in gold exploration and development. From 2000, production of gold at an industrial scale is growing, especially from the Geita (AngloGold/Ashanti) and Bulyanhulu (Barrick) mines. Tanzania, currently (2007) Africa's third largest producer of gold, claims a three percent mining royalty for most minerals and five percent for diamonds and gemstones. It has a conducive mining environment that has seen miners pumping into the country some US$2 billion in the past decade, according to the Tanzania Chamber of Minerals and Energy and in total mining companies have paid the government US$255,526,893 in taxes, within the same period. Tancoal Energy Limited ("Tancoal") was established on 3 April 2008, as a Joint Venture between the National Development Corporation of Tanzania (NDC) and Intra Energy (Tanzania) Limited (IETL), an 100% owned subsidiary of Australian publicly listed company, Intra Energy Corporation ("Intra Energy") (ASX Code: IEC). The Ngaka Coal Project is Tancoal’s flagship project. Located in the vast coalfields of south western Tanzania, the Ngaka Basin has the potential to host up to 1 billion tonnes of high quality thermal coal. Production of coal started in August 2011 at Ngaka in Mbinga District, Ruvuma Region, where the mine will initially be producing about 30 tonnes of coal per month, but at full capacity the output is projected to reach five million tonnes annually. The amount is well beyond the country's annual demand. Coal from Ngaka, according to investors, will be used in generation of 240MW of electricity by the year 2015. This will be a big boost to power supply in the country. Sources in the ministry of energy and minerals say that the lifespan of Ngaka Coal Mine is about 50 years. Leaving coal from Ngaka apart, Tanzania's energy industry is set to gain significantly from other coal fields. There is 800MW from the Mchuchuma and Kiwira coal mines in Njombe and Mbeya regions, respectively. In June, last year, the government announced that China would invest 400 million US dollars (abot 630bn/-) in the Kiwira coal mine project estimated to generate 200MW of electricity. The money, according to officials with the ministry, is expected to come under soft-loan arrangement. In September, last year, China's Sichuan Hongda Company Limited, signed a 3 billion US dollars (about 4.7tri/-) deal with the National Development Corporation (NDC) to mine coal and iron ore in Tanzania. The investment involves construction of the Mchuchuma Coal Mine and an accompanying 600-megawatt (MW) thermal power station. It is estimated that Mchuchuma coal deposits have more than 480 million tonnes of coal reserves. However, as the Minister for Energy and Minerals, Professor Sospeter Muhongo, rightly pointed out at the weekend that relevant authorities must act vigilantly to ensure Tanzania is not short-changed in all contract involving power supply. It is hoped that in all transactions, the win-win scenario will be achieved. Kibo Mining plc has been engaged in ongoing discussions with the Tanzanian Government and potential development partners regarding the development of a mouth-of-mine coal thermal power plant (“Rukwa Coal to Power Project”). Rukwa currently contains a JORC-compliant resource of 109 Mt of thermal coal (71 Mt of which is in the Indicated category and 38 Mt in the Inferred category) and it is anticipated that the proposed scoping study will quantify preliminary technical and economic parameters for a mining operation prior to completion of a feasibility study. The Company expects the results of the scoping study to be available towards the end of the year. One of the world’s legendary diamond mines, Tanzania’s Williamson Diamonds Limited is still going strong, 60 years after being established by Canadian geologist, Dr John Williamson. Williamson Diamonds Limited is situated in the town of Mwadui and in the province of Shinyanga, 130 km from the city of Mwanza in Tanzania. The mine has been through an illustrious past and was managed from the early 1970’s to 1994 by the Tanzanian Government. (Source: De Beers) De Beers was invited back in the early 1990’s to manage the Williamson mine and today Williamson Diamonds Limited is owned 75% by De Beers through Willcroft Co Ltd – Bermuda (a De Beers subsidiary), and 25 % by the Government of Tanzania. Diamond production from the three plants was expected to be in the region of 260 000 carats by the 2004 year end. De Beers has formed a joint venture with Dwyka Diamonds in Tanzania in which it has farmed out its remaining exploration licences in that country. Dwyka will actively undertake exploration to feasibility stage, at which point De Beers has the option to buy back in on the Mahene kimberlite, which sub-outcrops over an area of around 6,8 hectares, and the Itanana kimberlite, the smaller of the two Tanzanian kimberlites, measuring between 2,0 and 2,3 hectares in sub-outcrop. Previous but limited drill-core sampling (53 tonnes) by De Beers returned a diamond grade of approximately 8 carats per hundred tonnnes for Mahene and a sampling grade of 3 cpht for Itanana. Petra Diamonds completed the acquisition of the Williamson Diamond Mine (Petra 75%, Government 25%) from De Beers in February 2009. Williamson is the world’s largest economic kimberlite by surface area at 146 hectares in size. The Mwadui kimberlite pipe, upon which the Williamson mine is based, contains a diamond resource of approximately 39 million carats.14 alluvial diamdiferous placers have been documented but only two deposits derived from adjacent kimberlites have been described in detail. The New Alamasi deposit is located about 2,5 km east of the Mwadui kimberlite and consists of a calcretized, diamondiferous gravel resting on palaeo­ channels excavated into Archaean bedrock. It is thought to be Palaeogene in age and was deposited by ephemeral streams emanating from the Mwadui kimberlite. The grade averages 5,9 cpht, but the quality of the diamonds is unknown. Approximately 1,5 million carats of diamonds have been produced from this deposit. The Boshoff deposit, which has been fully exploited is a Tertiary colluvial gravel placer that extends up to 1 km away from the Kisumbi diamondiferous pipe near Shinyanga. This deposit produced a total of 7 334 carats with an average grade of 12 cpht and a stone size of ;3 carats. The other 12 placers are located to the southeast of Arusha, northeast of Lake Rukwa and at isolated sites in the east and extreme south of Tanzania. No other information is currently available, apart from the fact that one placer, 250 km southwest of Lindi, contains large stones of exceptional quality, some of which exceed 10 carats..
Tanzania's top gold producers are: Acacia, which now operates three mines in northwestern Tanzania, South Africa-based gold producer AngloGold Ashanti, owning the Geita open mine located in Geita Region, Shanta Gold operating the Luika Mine, Canaco Resources and Lake Victoria Mining Company, Tanzania Royalty operating the Buckreef Gold Mine and Stamico, operating the Tulawaka Mine. The Golden Pride mine, which was being operated by the Australia-based Resolute Mining, was closed down in 2014. The lack of new gold discoveries in recent times has prompted suggestions that Tanzania is mature or approaching maturity, in terms of gold exploration. New tectonic–metallogenic subdivisions proposed in this study are used to explain gold-endowment, assess gold exploration maturity, and suggest the potential for new discoveries from the following three regions: 1) the Lake Victoria Region, comprising the gold-endowed East Lake Victoria and Lake Nyanza Superterranes of < 2.85 Ga greenschist–amphibolite facies granitoid-greenstone terranes in > 3.11 Ga continental crust. These superterranes are separated by the gold-poor, Mwanza–Lake Eyasi Superterrane, comprising deeply eroded and/or exhumed terranes of gneissic-granulite belts and widespread granitoid plutons; 2) the Central Tanzania Region, comprising the Moyowosi–Manyoni Superterrane, which is largely composed of granitoid and migmatitic–gneissic terranes, and the Dodoma Basement and Dodoma Schist Superterranes, these are underlain by extensive, > 3.2 Ga migmatitic-gneisses and granitoid belts with interspersed, relatively narrow, < 2.85 Ga greenschist–amphibolite facies greenstone and schist belts. The Central Tanzania Region also includes the East Ubendian–Mtera Superterrane, comprising the East Ubendian Terrane of predominantly Paleoproterozoic belts with cryptic Archean age components, and the ~ 2.85–3.0 Ga Isanga–Mtera Terrane of thrust-transported migmatitic ortho- and para-gneisses; and 3) Proterozoic Tanzania Regions, comprising various Archean terranes which were once sutured to the Tanzania Craton prior to later Proterozoic orogenic and tectonic events that separated them from the craton and thermally reworked them. These include the Archean Nyakahura–Burigi Terrane in the Northwestern Tanzania Proterozoic Orogen and the Kilindi–Handeni Superterrane in the Southern East African Orogen of Tanzania. The major metallogenic significance of the new tectonic subdivisions is the recognition of under-explored belts: 1) in the gold-endowed East Lake Victoria and Lake Nyanza Superterranes, Lake Victoria Region. Here deeply weathered belts in the Musoma–Kilimafedha, Kahama–Mwadui and Nzega–Sekenke Terranes and belts, situated in tectono-thermally reworked crustal blocks such as the Iaida–Haidon, Singida–Mayamaya and Mara–Mobrama Terranes, are predicted to be prospective; 2) in the Dodoma Basement Superterrane, Central Tanzania Region, where relatively thin, juvenile granitoid-greenstone belts, similar to the ~ 2815–2660 Ma Mazoka Belt in the Undewa–Ilangali Terrane, contain small-scale gold systems with analogous terrane-scale geologic settings and evolution histories to those of gold-hosting greenstone belts in the Sukumaland Terrane, Lake Victoria Region. The overall geologic–geometric setting of the greenstone belts in the Central Tanzania Region (Mazoka-type) is comparable to those of the gold-hosting juvenile granitoid-greenstone belts in the South West and Youanmi Terranes, Yilgarn Craton, Western Australia, and North Superior and North Caribou Superterrane, northwestern Superior Craton, Canada; and 3) in the Proterozoic Tanzanian Regions, where terranes that lie in close geographic proximity and regional strike extension to the gold-endowed Lake Nyanza Superterrane are likely to be most prospective. They include the Archean Nyakahura–Burigi Terrane in unroofed thrust windows of the Mesoproterozoic Karagwe–Ankolean Belt of northwestern Tanzania, and the Kilindi–Handeni Superterrane where Archean proto-crust has been reworked by Pan-African tectonothermal events in the Southern East African Orogen. 1900s. Gold was discovered in the Lake Victoria region in 1898 by a German prospector, and mining began at the Sekenke Mine in 1909. 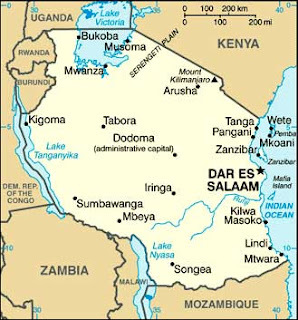 The United Republic of Tanzania was formed in 1964 through the merger of the erstwhile German colony and British protectorate of Tanganyika with the island of Zanzibar. Tanganyika had achieved its independence three years earlier, while Zanzibar became independent briefly in 1964 before unification with its mainland neighbour. It is estimated that gold production in Tanzania in the 20th century was 87 t (Elevatorski, 1995). Tanzania is well served by land, sea and air transportation routes. A road network connects Tanzania with Kenya, Malawi, Zambia, Uganda, Burundi and Rwanda. Any part of the country can be reached by the existing comprehensive road network of almost 54 000 km, of which 3 200 km are asphalt. Many roads are currently in poor condition and a major rehabilitation project began in 1990. Tanzania Railways Corporation runs the 2 600-km system linking Dar es Salaam with the central and north­ em regions. The Tanzania-Zambia Railway Authority (TAZARA) operates 1 860 km of track, 976 km of it in Tanzania, which links Dar es Salaam with Kapiri Mposhi in Zambia. It is mainly used to transport Zambian copper to Dar es Salaam port and Zambian imports in the opposite direction. 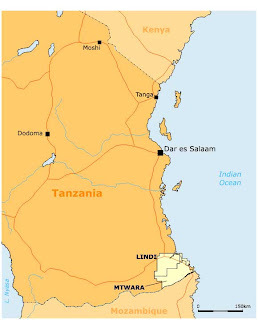 The principal coastal ports are Dar es Salaam, Tanga, Lindi, Mtwara and Zanzibar. They are managed by the Tanzania Harbour Authority. International airlines operate in and out of Tanzania through Dares Salaam and Kilimanjaro airports. There is a third international airport on Zanzibar. There are also several regional airports and numerous landing strips for use by charter planes. Air Tanzania operates regular services to most regional towns, and has scheduled flights to neighbouring countries and to the Middle East. Telecommunication facilities are available in most parts of the country. Fax, telex, expedited mail service, private couriers and cellular phones are also available. Tanzania has two earth satellite stations situated in Dar es Salaam, with a total capacity of 420 channels. The postsocialist government has promulgated new investment and mining legislation. In April 1990 the Bank of Tanzania introduced a liberal gold-buying scheme. The World Bank offers insurance cover for for­ eign investment in Tanzania. These measures have all assisted in attracting exploration capital to the country. The mining industry is regulated by the Ministry for Water, Energy and Minerals. The investment incentives include various tax-relief schemes and concessional tax rates which can be accessed by the investor under the Income Tax Act 1973, the Customs Tariff Act 1976 and the Sales Tax Act 1976, as well as the Immigration Act 1995. Some 90 per cent of the total gold output has been won from the greenstone belts (Fig. 4) to the south and east of Lake Victoria in northern Tanzania. The remainder has been from Proterozoic rocks, principally in the Lupa and Mpanda Fields. The Lupa Gold Field is in southwest central Tanzania, just north of Mbeya, while the Mpanda mineral field lies in west-central Tanzania, immediately adjacent to the town of Mpanda. The Lake Victoria Gold Field covers an area of more than 100 000 km2 and is characterised by large synfor­mal greenstone sequences elongated in an east-west direction. These greenstone belts are usually several tens of km long and up to 30 km wide. Their depth extension is estimated at several hundred to a few thousand metres. They are confined to the Tanzania Archaean craton. The Archaean terrain was derived from a primitive continen­tal crust of sialic (granite) composition (Ministry of Energy and Minerals Tanzania, 1999). The rocks of the Archaean greenstone belts were deposited in weak zones (rift and sag troughs) in the primitive crust, and subsequently affected by intense folding, intrusion of granite magma and regional granitisation that contributed towards the stabilisation of the craton. This Archaean craton is surrounded by two Proterozoic belts, namely the Ubendian (Western belt) and the Usagaran (Eastern belt). The Ubendian belt is more explored than the Usagaran belt. The Lupa and Mpanda Fields lie within the Ubendian belt which extends south­ eastwards from northeastern DRC into western Tanzania, northeastern Zambia and northern Malawi. The term 'Ubendian belt' refers to the terrain showing effects of the Ubendian orogeny. The rocks of the Ubendian belt consist of high-grade metavolcanics and metasediments, e.g. pyroxene-garnet granulite, garnet amphibolite, biotite migmatite, garnet-biotite-kyanite gneiss, mica schist and quartzite. Only a few gold deposits are known in the Usagaran belt, e.g. Kitowero and Ruvu. This east-west-trending greenstone belt has been the most productive in Tanzania, with a nearly continuous history of activity from 1932 to the present. Gold was discovered in 1913 at the Bismark Prospect by a German prospector. Banded iron formations of the Nyanzian Supergroup are closely associated with all the known gold occurrences of economic significance. This magnetic banded iron formation occupies a well-defined horizon within a poorly exposed sequence of pyroclastics, overlying mafic volcanics (Hester et al., 1991). The banded iron formation is folded into a complex syncline plunging gently to the northwest. Laterite is well developed at sur­ face, particularly over mafic volcanic rocks. Gold occurs in native form, often in close assiciation with pyrite and pyrrhotite, in fractures concordant with the bedding of the banded iron-formation units. Stratiform mineralisation predominates, although quartz reefs are present at some deposits. Wall-rock alteration, typified by chloritisation and sericitisation, is common. The Geita Mine, located about 5 km northwest of Geita, was once East Africa's largest gold producer with more than 28 t of gold produced between 1938 and its closure in 1966. The Mine workings follow mineralised frac­ tures in a single unit of banded iron formation along its northeasterly strike. This unit is 30-91 m thick (Hester et al., 1991). Ore occurs in quartz veins and siliceous breccias, partly concordant with the host rocks, often in association with felsic intrusives. Mineralisation consists of auriferous pyrite, native gold and minor pyrrhotite, chalcopyrite and magnetite. Intense small­ scale folding is locally present within the iron formation. From the low gold content of 0,78 g/t reported in the tailings, it seems that mill recoveries were good. In 1996 Ashanti Exploration of Ghana took over Cluff Resources which had reported open-pittable reserves of 12,6 t Au to the 100-m leveL Ashanti has subsequently revised the total mineral-resource estimate at Geita to over 373 241,7 kg (12 million oz), including inferred resources, according to Ashanti 's latest report on its operations. The Ashanti board of directors gave the project the go-ahead at the end of 1998, and the construction phase of the new mine is nearing completion. Ashanti says that Geita will produce 4 665 kg (150 000 oz) in the year 2000 and 15,5 t (500 000 oz) a year subsequently. In April 2000 AngloGold won the bid to buy 50 per cent of Ashanti's Geita gold project AngloGold will pay $205 million and invest an additional $130 million to develop the resource. The mine will be operated as a joint venture with Ashanti. Th e Lone Cone Mine, which closed in 1950, was loca­ ted on the same banded iron-formation ridge as the Geita Mine. Recent exploration has resulted in Ashanti's Lone Cone deposit having an estimated resource of 109 t (3,5 Moz) (Mining in Southern Africa,1999). Ashanti is planning to establish a mine here, scheduled to come on stream during the year 2000. 1999) and was conducting a pre-feasibility study on the property in 1998. 20 km west ofGeita. Prospectors in 1933 found the three Ridge 8 veins cropping out along the crest of a ridge, the core of which is a nearly vertical zone of banded iron formation 16-100 m thick (Hester et al., 1991). Mining at Ridge 8 stopped temporarily in 1954 to conserve capital. Ore was left partially stoped. There was no further activity until the implementation of the United Nations Development Programme's drilling programme of 1984-1986. This drilling programme encountered intersections of gold as outlined in Table 9. All the veins are thought to be nearly vertical, with values averaging 10,9 g/t Au. The Ridge 8 Prospect is now under intensive drilling. Resources of over 0,5 Mt are known to exist. This prospect was developed through an adit by the Saragura Syndicate. The gold mineralisation is hosted by banded iron formation and quartz porphyry. An assay of 7,4 g/t over 5,33 m is reported (Hester et al., 1991). The United Nations Development Programme drilled three diamond holes here in 1965, and located modest gold values. Artisanal miners are currently recovering gold from underground workings and from pits along strike to the northwest and southeast. Disseminated gold mineralisation at the Prospect 30 Mine is hosted in a stratabound banded iron-formation unit. The gold appears to be of secondary origin and its deposition related to laterisation. Mining continued until 1953. The site is receiving continuing attention from small-scale miners, so there was evidently some gold left behind. The Musoma and Mara areas, while geographically separated, show sufficiently similar geology so as to be considered a unit. Maximum gold production in this area was between 1922 and 1960. The largest producer was the Buhemba Mine, with a production of 12,4 tAu, ranking second after the Geita Mine. Rocks of the Nyanzian Supergroup host the gold deposits and comprise a sequence of basic and felsic volcanics and tuffs, with one or two well-developed horizons of magnetite-facies banded iron formation contain­ ing minor pyrite. In the Mara District, these rocks are succeeded by gneisses and schists. All the rocks have been metamorphosed to greenschist facies (and higher in the Mara District) and folded along axes striking north­ east. Mineralisation is characterised by flat or steeply dipping quartz lodes (mostly shear hosted) carrying pyrite, gold and minor base-metal sulphides. Carbonate alteration of wall rocks is related to regional faults. The association of some gold lodes with banded iron formation units is also common. The mine produced 12,4 t Au between 1930 and 1970, at an average grade of 10,4 g/t. Two ore bodies were mined. Initial mining by underground methods was on flat quartz veins dipping 20-40°. Subsequently, a stockwork ore body was mined to a depth of 15 m by open-pit methods. Host rocks are mafic pyroclastics that have been intensely carbonatised. Estimated reserves of 23,23 tare contained in 11,425 Mt of ore and in tailings at the old mine. Tanganyika Gold is currently prospecting in this area. The deposit is located about 30 km west of the Buhemba Mine. Tabular, siliceous, steeply dipping ore bodies in sericitic schist, overlain by laterite, were mined to a depth of 450 m. The main ore body is about 30m wide and 200m long (Elevatorski, 1995). Gold occurs in close association with pyrite and pyrrhotite, with lesser amounts of arsenopyrite. Kiabakari is now the site of an army base. Claims were first pegged in the area in 1933 over a small gold reef. Further work showed the existence of mineralised dykes which cut sheared greenstones impregnated by auriferous sulphides. A mill was erected in 1935 and, up till 1940, more than 20 000 t of soft ore were quarried from the oxidised zone of the mineralised greenstone body for the recovery of about 93 kg Au. There was no further activity until 1950, when the Colonial Development Corporation exercised an option over the property and instituted a programme of trench­ ing and diamond drilling. This work indicated the exis­ tence of a large-tonnage deposit and, in 1953, a compa­ ny known as Tangold Mining Co. Ltd was formed to exploit it. The mine first came into production early in1959. The Kiabakari Mine was the third largest producer of gold in Tanzania, yielding 8 814 kg Au between 1959 and 1966. The average recovered grade was 6,7 g/t Au. A further 108 kg were produced earlier from 18 000 t of oxidised outcrop material. A 0,7-m-wide, steeply dipping quartz vein (the Main Reef) was discovered in 1932 and mined until l970 to a depth of 165m. Average gold content was about 10 g/t. Two shoots were also mined from a parallel structure, the Mill Reef. Several veins of lesser size have been worked sporadically in the general area. Production is recorded as 178 496 t of ore, from which about 2 000 kg Au were recovered. 350 m has been turned over to a depth of 1-2m by artisanal miners, and visible gold has been recovered from ill-defined stringers. Reports by the Geological Survey of Tanzania show that closely spaced, erratically mineralised veins were encountered in underground workings at shallow depth. Probable ore reserves at Nyabirama amount to 7 Mt, grading 2,5 g/t Au. The main body of mineralisation lies on strike parallel to and up-dip of the Mara shear. Nyabirama and Nyabigena will be developed as two open pits by the privately owned Australian company Afrika Makariki Gold Mines to provide an initial mine life of 10 years, after which there is underground potential as both deposits are open to depth. Coincidentally, the resource of both pits occupies an area about 400 m long by 50-70 m wide and the planned open cut in each case will be about 100 m deep. Nyabigena has a probable reserve of 4 Mt of ore grading at 3,7 g/t Au. It is a structurally controlled deposit occurring within an irregularly shaped, but linear, dilation zone at the intersection of two region­ al shears. The main body of the mineralisation is hosted within a zone that occupies the stressed pathway of one of the shears through a brittle lithology of andesite and andesitic tuff. Sampo Resources Tanzania Ltd 14 per cent The Ikungu Mine lies on the shore of Lake Victoria 18 km southwest of Musoma, in a small greenstone area isolated from the main Musoma-Mara Greenstone Belt. Between 1936 and 1952 the Mine produced 587 kg Au from ores grading 12,5 g/t. Mining reached a depth of only 100 m. Production was from auriferous quartz lenses in shear zones striking west-northwest. An arsenic anomaly was detected, during a geochemical survey by the Tanganyika Geological Survey, over the main reef. This anomaly, believed to be related to gold mineralisation, persists for 500 m along strike with a maximum width of 100 m. Western Areas planned to sell its interest in 1997-98. Gold was discovered at Mrangi during German colonial times. The deposit is located 40 km northwest of Bunda. In spite of the thick vein and reported spectaular gold values near surface, the total recorded production was only 213 kg Au. A number of artisanal miners are working at the site. The host rock comprises poorly exposed volcanics. Geochemical sampling by Ormonde Mining in 1996 showed gold-in-soil anomalies with strike lengths of up to 3,5 km, and significant gold grades were returned from a limited trenching programme. Reportedly the mine is only 35 m deep, and may contain significant gold reserves. In September 1997, Onnonde agreed that South African group Iscor could earn up to 70 per cent interest in the Mrangi property. To earn this interest, Iscor had to spend US$5,3 million on explo­ ration and evaluation over a seven-year period. This deposit was discovered in 1910 and worked spo­radically until 1956. Underground mining was abandoned in 1940, and operations were reduced to surface mining and processing of payable rubble at a rate of 15 t a day. Total production was 119 kg Au from ores averaging 10,3 g/t. In 1967-1968 the United Nations Development Programme investigated an area 2,4 x l,2 km and outlined a gold deposit with geological features similar to those at Maji Moto. The area contains five gold­ bearing shear zones over a distance of 500 m, trending east-west, in amphibolitic greenstones. Average grade is 10,3 g/t. Inferred extensions of the shear zones, hidden under the alluvial rubble and laterites, give a total length of over 2 000 m. Simba Sirori offers excellent opportunity for discovery of bulk-mineable, oxidised near-surface gold mineralisation. The mine operated between 1922 and 1970. Three ore bodies, occupying a major shear in carbonated volcanic rocks, were mined. Auriferous quartz veins were generally about 1 m wide, but locally swelled to several metres. The veins have strike length of 1,5 km and a vertical depth of 160 m. Tanganyika Gold is currently prospecting in this area. This deposit was mined at several places along a subvertical north-northeast-south-southwest-striking quartz vein in a shear zone. Ore grading about 25 g/t was mined from soft haematite-rich shoots and gold-bearing rubble under lateritic capping. A small mill operated until several years ago. This deposit was worked on a small scale from a single ore shoot within a shear zone. Grades averaged about 21 g/t. The ore contained substantial quantities of base-metal sulfides and pyrite. Host rocks are fractured granites. From all acounts, the ore shoot was worked out, but structural re-interpretation of this complex area could yield new targets. Scattered and irregular gold mineralisation occurs as veinlets along about 230 m of the shear contact between a granite and a granodiorite. Some encouraging values of gold can be found in the veins, but continuity is poor. There was a small production between 1928 and 1940. The topography of this greenstone belt is that of a plain with low rolling hills. It is an extension of rocks in the Mabale, Geita and Rwamagaza Belts. Wall-rock alteration, typified by chloritisation and sericitisation, is common. This prospect was discovered in 1976 by small-scale miners in what was perhaps the first gold rush during the present period of activity. Up to 10 000 miners worked the outcrop of what turned out to be a siliceous zone averaging 13 g/t Au. Twenty-two holes were drilled by the Tanzanian government in 1978 in a joint venture with French interests. Resources calculated from the drilling results were reportedly in the range of 2 Mt. This tonnage does not include the amount of oxidised material near outcrop which could probably be treated by heap leaching. In March 1989, a licence covering this property was issued to Kahama Mining, a fully owned subsidiary of Sutton Resources of Canada. Four major quartz reefs occur at Bulyanhulu, of which drilled reserves were estimated for only one. The quartz reefs are emplaced in northwest-southeast-trending shear zones. The overall strike length of the structure containing the resources is about 1 400 m. The veins average 4,3 m in thickness and dips are about 70-80° to the northeast. A fault cuts off the mineralisation at the southeast end and, to the north­ west, the mineralised bodies disappear under laterite cover. Host rocks are silicified, graphitic schist and felsic tuff encased by kaolinised volcanic rocks. Oxidation extends to a depth of about 55 m from surface. At depth the veins contain pyrite and chalcopyrite. A feasibility study modelled a 2 500-t-per:-day underground mine capable of producing in excess of 9 331 kg (300 000 oz) Au a year. Gold resources of 273,7 t (8,8 Moz, 1999) plus associated silver and copper have been outlined to date. Sutton anticipated that a fully commissioned mine at Bulyanhulu could pour its first bar in 1999. However, Sutton Resources revisited its development schedule for the project and orders for plant and equipment, and commencement of the shaft and underground construction, were deferred until the gold price and equity markets firmed. Recently, Barrick Gold took over Sutton Resources. The deposit, located about 100 km south of Lake Victoria, was discovered in 1992 by regional reconnaissance sampling by the German and Tanzanian Geological Surveys. The Golden Ridge project area is underlain by folded and thrusted Nyanzian felsic volcanics, pyroclastics and banded iron formation. The deposit has a strike length of over 5 000 m where mineralisation is developed within a number of stratabound zones in a banded iron formation/banded ferruginous chert. Gold mineralisation is hosted in three environments: sulphidised magnetite layers, cross-cutting subvertical tensional quartz veins, and a flatter cleavage structure which postdated the quartz veining. Gold is usually very fine grained and is oxidised down to a level of 30-50 m.
In 1995 Randgold exercised an option agreement with Pangea, creating a joint venture with Pangea in which Randgold took over management of the project. In March 1999 Barrick Gold Corporation acquired all of Randgold's interest in the joint venture, and assumed all of its rights and obligations under the agreement. Barrick has the right to increase its interest to 65 per cent by completing a bankable feasibility study, and by securing total project financing by September 2000. Extensive drilling and metallurgical studies have con­ firmed the potential for an open-pit mining operation, with the ore amenable to both heap leaching and con­ ventional milling extraction techniques. A total resource of 42 524,28 kg is estimated. Gold mineralisation was first discovered at Jubilee Reef in 1898. Mineralisation occurs in a shear zone of highly folded banded iron formation in contact with rhyolite tuff, cut by chert intercalations. Within the shear zone are gold-quarts veins localised in subparallel faults. At the surface the reef is highly anomalous but subeconomic (0-3 g/t Au). In the adits higher gold values have been recorded, and at the 33-m level gold values peak at 46 g/t Au, averaging 7,8 g/t over a width of 1,1 m. Jubilee Reef has an estimated strike extent of over 1 km. In June 1998 Maiden Gold entered into a joint-venture agreement with Avgold (Tanzania) Ltd for Avgold to spend US$2,45 million to earn 60 per cent in Maiden's Tanzanian interests. Maiden would manage exploration, and Avgold would manage any bankable feasibility and consequent development and mining. Field work was expected to resume in the September quarter. The Nzega Belt, in central Tanzania, supported several small-scale gold mines prior to the Second World War. Little prospecting has been done since. Greenstones of the Nyanzian Supergroup comprise felsic volcanics, banded iron formation, and subordinate mafic volcanics and sedimentary rocks. Mineralisation is mainly shearzone controlled, but some minor deposits, where miner­ alisation is hosted by banded iron formation or felsic tuff, also occur. 50 per cent of the project from Ashanti. Oxide ores were discovered at the site of the Canuck Mine in 1944. The mine, about 50 km northwest of Nzega, was active between 1951 and 1953 and produced gold averaging 6,8 g/t . At least four ore shoots have been recognised along the structure, but only one was mined. The ore body is a nearly vertical, 1-4-m wide, quartz vein within a shear zone at the contact of a banded iron-formation unit with granites, striking 020°. The mineralisation is composed of auriferous quartz and sulphides, oxidised to a depth of 65 m. The mine has reported reserves of about 4 Mt grading 8 g/t Au. This mine, located about 45 km northwest of Nzega, started operating in early 1991 and produced about 3 kg Au per month from a mechanised surface operation. Host rocks are basalts and feldspar porphyries. Gold occurs in steeply dipping quartz lodes carrying minor haematite or pyrite. Grades of up to 15 g/t occur in narrow veins, while wider veins (up to 2m) tend to be lower grade. Secondary gold is recovered from surficial rubble zones consisting of vein-quartz boulders in a matrix of laterite. The rubble zones are typically only 1 m thick, and contain variable gold grades, usually in the order of 3 g/t. Greenstone-belt gold prospects occur over a broad area concentrated around the Iramba Plateau. Gold was discovered here during the German colonial period. Total production is reported to be 4 698 kg with 4 370 kg of this coming from the Sekenke Mine. There has been little activity since 1959, except for recent attention from artisanal miners. The gold of the Iramba-Sekenke Greenstone Belt is closely associated with mafic and felsic volcanics of the Nyanzian Supergroup, with subordinate banded iron for­mation. The area is cut by acid and basic dykes. All the important auriferous reefs are associated with shears, some of which have strike lengths of hundreds of metres and have been proved to continue to considerable depths. The reefs usually have an enriched oxidised zone near the surface, but sulphides are normally encountered at comparatively shallow depths. The sulphides are mainly pyrite, with sometimes arsenopyrite, chalcopyrite, pyrrhotite and galena. Except at Sekenke, mining has been confined to the enriched oxidised material. Examples of impregnation deposits are Kinyalele and Kisamamba. The Sekenke Mine, located a few kilometres southwest of Sekenke, was discovered in 1907 and worked from 1909-1959 at an average grade of 15,4 g/t gold and 2,5 g/t silver. Several parallel quartz veins contain gold values close to the contact between greenstone and diorite. Economic mineralisation has widths of 0,5-2,5 m. Mineralisation was detected along a strike of 2,6 km, but mining was confined to a much shorter length. The veins occupy shears which strike northwest and dip steeply. A feature of the mine is the albitisation and silicification of the dioritic wall rock. The tailings dump here contains an estimated 200 400 t of material averaging 2 g/t Au, which might be of interest to a small-scale operator. The Sekenke deposit which has a resource of over 31 t (1 Moz) Au, is under intensive evaluation by AngloGold. The Kirondatal Mine, about 20 km southeast of Sekenke, is said to have been exploited by Arab traders in pre-colonial times. From 1934-1950 it produced 23 150 t of ore which yielded an average gold grade of 8,9 g/t. Vein-type ores occur in intersecting shears within greenstones, intruded by quartz-albite dikes. At a depth of 40 m, sulphide ores with pyrite, pyrrhotite and arsenopyrite are encountered. To the south of Sekenke, and belonging to the same northwest-southeast vein system, were two mines known as Papas and Kikkides which were united under one management with the name Union Gold Mines. Papas Mine is a quartz reef in a vertical shear, 0,9-1,2 m wide, and in the continuation of the Sekenke diorite band. The reef has been worked to a depth of 21-27 m. The reef at Kikkides Mine was found to average 0,6-0,9 m in width and dip 45° to the south­ west. The reef, present within a shear, has been opened to a depth of 24 m. Host rock is granite. Depending on the literature source, this deposit is referred to as either Kinyalele or Kinyanele. This old mine is on the eastern scarp of the Iramba Plateau, about 40 km southeast of Sekenke. Vein-type ores, striking 035° and dipping 45°, were mined from fractured chloritic schist and phyllite intruded by granite. Gold mineralisation of dissemination type occurs, in a suite of metamorphic rocks of Archaean age, in this deposit. The lodes at Kisamamba form two parallel groups, approximately 152 m apart, which strike east. Host rock is quartzites. 1930s to the 1950s. The principal mine was at Mawe Meru in the northeastern part of the belt. Gold occurs as inclusions in pyrite and pyrrhotite. Wall-rock alteration, typified by chloritisation and sericitisation, is common. The mine is located about 20 km east of Rwamagaza and was an underground operation working a high-grade gold-quartz vein containing much pyrite and chalcopyrite. It was the largest producer in the Rwamagaza Greenstone Belt. Total production, up to closure in 1952, was between 80 000 and 90 000 t of ore, with an average grade of about 25 g/t Au. Tanganyika carried out a reverse-circulation drilling programme and new drilling results have confirmed mineralisation over a strike length of 500 m. Host rocks are fractured mafic volcanics near a granite contact. Ownership in 2001: East Africa Gold Corporation 80 per cent. About 1 088 kg Au were recovered from shear-hosted quartz reefs at this underground mine from 1982 to January 1991. Buck Reef is located about 5 km north­ west of Rwamagaza village. The mineralised shear system has a steep dip to the east in both the north and south ends, but in the centre the shear is vertical. Host rocks are mafic metavolcanic rocks made up of pillowed, amygdaloidal and massive mafic flows, intruded by medium- to coarse-grained diorite. Further exploration of this deposit will take place along strike and at depth, where further mineralised intersections are present at 200 m depth. The Buck Reef mining licence contains 3,7 Mt grading 3,26 g/t Au. Free gold was mined from a 1-m-thick rubble zone at the base of laterites above greenstones. About 54 000 t of ore was mined, producing over 435 kg Au. An extension of the rubble zone was discovered in 1984 and many miners began working in the area exploiting gold nuggets. The nuggets are rough, not water-worn, and may have been concentrated during the laterisation process. Generally, the gold rubble zone is covered by a 3-m-thick, hard, pisolitic duricrust. 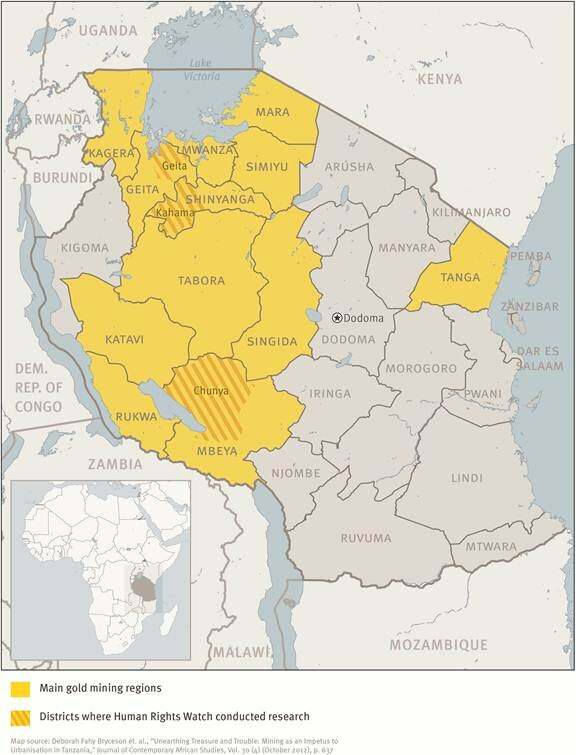 Ownership in 2001: East Africa Gold Corporation 80 per cent This area lies near the centre of the greenstone belt. Numerous auriferous quartz reefs are known in the area, several of which are now being worked by artisanal miners. The gold is found in an up to 80-m-thick shear zone and a surrounding lateritic deposit. Gold values range from 3,4 to 51,3 g/t. In 1998, an infill drilling programme was conducted to improve the status of the known resource and confirm the potential for a viable mining operation. Artisanal miners have recovered considerable eluvial gold and nuggets from Buziba Creek, about 2 km upstream from its confluence with the Nyikongo River. Nuggets were found in 1-m-thick mottled clay in a laterite. Underlying rocks are fuchsite­ rich ultramafics. The Nyamutondo area of artisanal mining activity lies west of Rwamagaza. Results from three holes drilled by the UNDP did not yield encouraging results. However, it is not certain whether or not intervals were sampled where no quartz was visible but which could contain disseminated mineralisation. The extent of artisanal activity and the proximity to Buck Reef Mine suggest that Nyamutondo has potential for veins or secondary enrichment zones beneath the well-developed laterite. The Sabura Mine was active in the late 1930s and produced ore grading about 10 g/t Au. Auriferous reefs are hosted in basalt. No other information is avalaible. Scattered occurrences of greenstones east of the Geita and Rwamagaza Greenstone Belts are referred to as the Mabale Greenstone Belt. The rocks appear to connect with the Geita belt to the west and with the eastern part of the Kahama belt to the south. banded iron formation is well developed. Many small occurrences of gold are known, but the recorded production is small. Most of the prospects consist of little more than a few pits and trenches in which gold has been noted. Field reconnaissance would be necessary to identify prospects of merit. Gold is reported to occur in steeply dipping lodes, a few centimetres to several metres thick, at a number of localities in the remote Kilimafedha Greenstone Belt. There has been little sustained production since mining began during the German colonial period early in this century. Many of the greenstone exposures, and over two-thirds of the gold prospects, lie within the Serengeti National Park where mining is prohibited. Additional areas of potential interest are within two game reserves, where mining would be allowed by special permit only. Exploration opportunities may exist in the weathered zones of banded iron-formation enclaves near Fort Ikoma in the north and around the more accessible Ndutwa area in the southwest, to which no restraints apply. The Lupa or Chunya Gold Field occupies a triangular fault-bounded area of about 2 600 km2. Alluvial gold was first discovered in the Lupa River in 1922. The first lode mining began at Ntumbi in 1934. Production totals more than 25 t Au. The Lupa Gold Field is underlain by a block of deformed and highly metamorphosed schist and gneiss, with intermixed banded iron formation, volcanics and granitic intrusions. The Lupa Gold field differs from the Lake Victoria greenstone belts in being hosted by metamorphic rocks of Proterozoic age, rather than Archaean. The gold deposits in the Lupa Gold Field consist of quartz reefs associated with shear zones, as well as alluvial and eluvial deposits. Mineralisation in the reefs consists of quartz veins (about 90 per cent by volume) with small amounts of carbonate, sericite, chlorite, tourmaline and pyrite. The veins are surrounded by zones of pyrite-rich wallrock alteration. These alteration zones range from a few metres to several tens of metres, both in the hanging wall and the footwall. Mafic rocks are the most favourable host rocks to mineralisation because they provide iron for the sulphidisation process required to precipitate gold from the mineralising fluids. Almost half of the gold production from the Lupa Gold Field came from alluvial deposits. Block-faulting has caused strong dissection of parts of the Lupa area, and it is in the rejuvenated drainage system that mineable placer deposits are found. Eluvial deposits in the Lupa area occur close to gold-bearing quartz veins and close to magnetite-bearing quartzite. These deposits are generally rich but very small in size. From 1939-1956 the New Saza Mine produced 8 390 kg Au from ores averaging 7,5 g/t. Ore was mined from 17 shoots and rubble zones from a 16-km strike length on the Saza Shear Zone. The maximum depth of mining was 250 m below surface. Ore bodies consist of steeply dipping lenticular quartz bodies, generally 1,5 m wide in shear zones. Maximum width of these quartz veins is 10 m. Host rocks are schist and metabasite in a fault contact with granite. The quarts veins contain variable amounts of sericite, chlorite, tourmaline and carbonates. Pyritic sulphides make up about 5 per cent of the veins by volume. Carbonatisation, sericitisation and chloritisation are the dominant alterations. In addition to gold, about 7 558 kg silver were recovered. Another important producer was the Ntumbi Reef, located about 45 km north-northeast of Lupa, which during 1937-1965 yielded 1 709 kg Au from ore grading 12,1 g/t. Fifty known veins occur within an area of 15 km2. The deepest workings extend to only 120-m depth. Quartz reefs are hosted in a metabasite intruded by granite. The reefs appear to be associated with shear structures. The ore of the Ntumbi Reef is mineralised with pyrite and subordinate chalcopyrite and galena. Calcite and tourmaline are often present and molybdenite has also been noted. Only about one quarter of the 1 200 m of strike of known shear zones has been prospected. Both Techno-export and the United Nations Development Programme recognised a potential for 450 000 t of ore containing 6 000 kg Au grading 14 g/t. The mining area, worked by many artisans, is about 8 km southeast of Lupa. These deposits are the most promising of several placers, with a recorded production of some 3 200 kg Au. The area is known for large size nuggets, some up to 3,11 kg, found in headwaters of gullies at the edge of laterite overburden. A 1974 Techno-export study recognised a potential for over 9 000 kg Au. About 20 veins in this central portion of the district were previously worked to shallow depth. According to Techno-export, mineralisation in shears within quartzitic rocks contains some 2 400 kg Au in ore with a grade of 8 g/t. These old mines are near the east end of the Saza Shear Zone. An estimated 1,3 Mt, grading 9,8 g/t Au, lie in this sector. The Gap is the most promising prospect where quartz reefs occur in shears of gneiss and schist. Based on STAMICO drilling during 1975-1977 the Gap deposit probably contains about 1 Mt, with grades between 7,89 and 13,46 g/t. A drilling programme undertaken by Technoexport of the former USSR included some work at Nkatano. Fifteen drill holes located an ore shoot 260 m long, averaging 10 g/t Au. These old mines all had small workings on high-grade veins in the east-central part of the Lupa District. Reserves appear limited and suitable mainly for small mining operators. Potential exists for bulk-mineable mineralisation in shears known to be mineralised, but not extensively explored. Sengambi is about 30 km east of Chunya, where small­ scale mining has been active in recent years. Auriferous veins are hosted in gneiss and schist. No other information is avalaible. The district is unique in Tanzania for having produced most of its gold as a by-product of lead and copper mining during 1946-1960. A small amount of placer gold was produced from the Mpanda River during 1936-1947. Since 1980 considerable artisanal mining activity has been noted, especially near Ibindi. Lead, copper, gold and modest amounts of silver occur in several veins and shears. Important production was limited to the Mukwamba Mine near the town of Mpanda, and to placers and eluvials near Ibindi. The Mpanda area is underlain by metamorphic rocks of Proterozoic age, rather than Archaean. The geology is dominated by high-grade metamorphic rocks derived from volcanics and sediments, and intruded by granites. Regional structures in the Mpanda area include almost vertical foliation, faults and lithologic contacts trending northwest-southeast. Mineralisation is aligned with a northwest-southeast-trending belt that is up to 40 km wide and 90 km long. The mineralised belt is dominated by two successions known as Katuma and Ikulu. The former is dominated by migmatite and gneiss, while the latter consists mostly of amphibolite and schist. Gold­ rich deposits are confined to the contact of the Ikulu and Katuma units. Mineralisation is associated with a north-south-trending shear zone and is contained in quartz-siderite veins with haematite. About 50 veins are known in an area of about 80 km2. Some of the reefs are dominated by pyrite, galena and chalcopyrite. During 1959-1971 about 2 177 kg Au and 118,2 t of silver were recovered. Mineralisation is confined to a shear zone in chlorite-sericite schist. In general, veins consist of banded quartz, with variable amounts of siderite, calcite, barite, sericite and haematite, with lesser amounts of pyrite, galena, chalcopyrite and gold. Ore grades at Mukwamba were in the order of 1 to 3 per cent lead, 0,1 to 1 per cent copper, 50 to 200 g/t Ag and 1 to 5 g/t Au. In 1996, the Chocolate Reef was discovered in a sheared granite host. Chocolate Reef was a joint venture between Pangea Goldfields and AngloGold. Under terms of agreement, Anglo American had agreed to arrange the financing required to bring any future mine into production. Anglo American had to make a production decision by July 2001. The deposit is estimated to have about 1,5 Moz Au. Drilling indicated that 87 per cent of the resource is in the top 175 m and therefore will be amenable to open-pit mining. On the eastern slopes of the Uluguru Mountains, and in the low country beyond, there are alluvial deposits in the streams and terraces of the Ruvu River. Exploitation of alluvial gold in this area began in 1932, when it was found below the Ruvu Bridge. The highest production of 12 kg (382 oz) was reached in 1935, when about a dozen workers were engaged. Then followed a rapid decline in output, and by the end of 1939 only three operators remained. The last recorded production was in 1942 (2 kg). Successful gold workings have been confined to the Ruvu River, and its tributary the Mfisigo, and to the Mtombosi which is a tributary of the Mvuha River. The workings have, moreover, been limited to certain very short reaches of these rivers. Gold is found in clay and the bottom 2,5-5,0 m of overlying gravel. During 1933-1934 a modest amount (400 g) of alluvial gold was produced from the area. The prospect lies at the eastern margin of the Selous Basin, where Karoo and younger sediments are in fault contact with Proterozoic rocks consisting of granitic gneiss, biotite schist, garnetiferous amphibolite and quartzite. Wingayongo Hill is an isolated hillock rising 20 m above featureless flats, north of the Rufiji River and northeast of the town of Utete. Abundant signs of hydrothermal alteration have been noted: fracture coatings, vugs filled with sulphur and bitumen, silicified boxwork texture, fracturing and, possibly, kaolinisation. Mineralisation includes fluorite, pyrite, arsenopyrite, chalcopyrite, barite and pyrrhotite. The Wingayongo alteration and mineralisation fit the classic description of shallow epithermal and hot-spring precious-metal deposits. In 1996 Patrician Gold Mines completed a diamond-drill hole, 281 m deep, which intersected sub­commercial amounts of copper (chalcopyrite and bornite) and gold, but the hole missed the zone in which better mineralisation is expected (revealed from a hole drilled in the 1950s). The company reported that results confirmed the epithermal origin of the deposit. The key exploration targets are faults through the greenstones which have enabled mineralised fluids to rise to the surface. Some of the biggest names in world mining are chasing these classic gold-bearing structures. 1,42 g/t Au over a 400-m strike length. The property consists of two prospecting licences covering 210 km2 adjacent to the old Geita Mine. SAMAX began exploring the area in 1994 and, by 1998, had identified three main areas of mineralisation ranging in thickness from 25-50 m using a programme of geological mapping, soil sampling, trenching and reverse-circulation drilling. Gold mineralisation lies along two parallel shear structures, the Juma and Kasata shears, and is preferentially developed in chert-banded iron-formation units. SAMAX said that it would continue to explore the property aggressively. Metallurgical, engineering, environmental and financial studies would begin once the resources had been suitably developed. In February 1998, the total indicated-inferred resource was 9,956 Mt of ore, grading at 4,81 g/t Au. Ashanti Gold Fields Company Ltd earning 75 per cent Kakindo is located northwest of the Buck Reef gold deposit and is underlain by an assemblage of mafic and felsic volcanics, intersected by several prominent north­ east-striking structures. The Kakindo property was the scene of one of the largest gold rushes in Tanzania in June 1997, when some 200 000 to 300 000 artisanal miners decended on the Kakindu licence area where Pangea/Ashanti had located a large geochemical anom­ aly in laterite. An estimated 10 t Au were removed over an 18-month period from an area 1,5 km x 700 m. The majority of the local miners have now been removed, although not without complaint, and Ashanti and Pangea were confident of resuming work. Infill and extension drilling continued in 1988 . at Nyankanga, with the gold resource being increased from 28 t (0,9 Moz) to more than 37 t (1,2 Moz). The gold is associated with pyrite mineralisation and is hosted in a thick sequence of banded iron formation that forms a prominent northeast­ trending ridge. Approximately 29 per cent of the resource is within an oxide zone, 16 per cent in a transitional zone and the remainder in sulphides. 1,81 m, 3,21 g/t over 9,54 m and 5,74 g/t over 3,04 m. The rocks between the zones are siliceous. In 1998, Minorca Resources agreed to acquire a 50 per cent interest in Itetemia for C$11 million cash and completion of a feasibility study. Diamond drilling at Itetemia was scheduled to begin in mid-January 2000. Ormonde Mining PLC earning 50 per cent The Mgusu deposit is located approximately 12 km northwest of Geita. Regional exploration, including geophysical surveys and geochemical soil sampling, was completed in 1997/98 on this 153-km2 concession. In October 1998, Pangea completed an agreement with Ormonde Mining of Ireland who may earn a 50 per cent interest in the property by spending a total of $US2,6 million over a three-year period, with Ormonde taking over the operation and management. Pangea has previously outlined a 8 429-kg gold deposit on the property. However, this resource is preliminary and based on a very widely spaced drill programme. Mineralised shears occur within a porphyritic intrusive and near the contact between porphyry and banded iron formation. The porphyry hosts several wide zones (16-60 m), grading from 0,3 g/t to 0,9 g/t Au, indicating the presence of a significant mineralised system. The Tulawaka property comprises four prospecting licences and is located on the unexplored western extremity of the Rwamagaza Greenstone Belt. In 1997 a regional soil-sampling programme was completed on this 454 km2 property. In 1998 exploration focused on two major geochemical anomalies, each measuring over 3 km in strike. Drilling was also undertaken in 1998. In November/December 1999, numerous drill intercepts of high-grade gold were reported including 121,61 g/t over five metres and 44,58 g/t over 12m. The deepest intercept to date intersected 10,92 g/t over 7 m at a vertical depth of 160 m.
At the East Zone, deep drilling west of the main vein continued to intersect several parallel veins, as well as mineralised quartz porphyries. Veins intersected in that sector returned values up to 19,21 g/t over 3m. In addition to the deep drilling, 121 short reverse-circulation (RC) holes were completed to extend the talus zone in the East Zone and to test for a similar tallus zone over the West Zone, located 4,5 km to the west. Results were pending. Additional drilling including diamond drilling, commenced in January, 2000. Work by Russian geoscientists at Kasanga Bridge in the 1970s identified very high gold values in both quartz veins and banded iron formations. Grab samples of banded iron formation, collected by Ormonde Mining over a strike length of 350 m, have returned gold grades of up to 7,19 g/t. Grab samples of gossan within the banded iron formation have returned grades of up to 144 g/t. These samples lie within an area of up to 2,5 km by 1,5 km containing highly anomalous gold-in-soil values, suggesting the potential for continuity of mineralisation over significant strike lengths and widths. This target was to be drilled in 1999. The geology of this deposit is characterised by quartz veins in a weathered basalt, possibly including shear related gold. Goldstream Mining purchased a 46 per cent interest in the prospecting licence from Tanami Gold NL in 1996. During 1997, a helicopter-borne magnetic survey was completed and preliminary interpretation of data identified a number of structural targets that required drilling. All 18 holes intersected a sheared basalt which was highly weathered near the surface. In late 1997, Goldstream bought Titan Resources NL's 46 per cent. In mid-1998 Anglo American's subsidary, Anmercosa Exploration Ltd, which had been earning 60 per cent, withdrew from the joint venture, claiming strategic reasons not based on the prospectivity of the area. A programme of 3 500 m RAB drilling was carried out to test for extensions to gold mineralisation. Results were pending. (185 km2) gold values of up to 3,5 g/t over 3 m were ntersected in several locations within the shear zone. Narrow quartz veins, with occasional visible gold, returned gold grades of up to 34 g/t over 1 m.
Ownership in 2001: Ormonde Mining PLC option to earn 85 per cent and 100 per cent on the respective prospecting licences. The Bukoli project consists of three prospecting licences covering a total of 91,5 km2 , some 23 km west of the Bulyanhulu deposit. Ormonde is earning an 85 per cent interest in one prospecting licence and 100 per cent in the other two prospecting licences. Geochemical and geophysical surveys carried out by Ormonde outlined three zones of anomalous gold levels in soil, over a strike length of 3,3 km, overlying a zone of shearing and quartz veining which appears to lie along the contact between greenstone and granite. A RAB and reverse-circulation drilling programme was planned for early 1999. Ownership in 2001: Ormonde Mining PLC option to earn 100 per cent. Artisanal mining activity is widespread in the Lyaruu prospect area, which comprises a sulphide-rich quartz lode within sheared altered schists. The shear system has an exposed length of 200 m and width of 5 m, but is obscured by soil cover to both north and south ofthe cur­ rent artisanal pits. The total length of the gold-bearing quartz-vein shear structure is 500 m. Surface trenching gave best results of 1,2 g/t Au over 12,5 m, 1,03 g/t over 14m and 1,8 g/t over 12,5 m. However, grades of up to 15,25 g/t Au have been returned from quartz veins. Samples from wall rock have returned positive gold values and Ormonde Mining believes the prospect has potential of economic grades over significant widths. This target was to be drilled in 1999. This 21O-km2 concession is located immediately south of, and along strike to, the 230-t (7,4 Moz) Bulyanhulu gold deposit, and is underlain by intermediate and felsic volcanics with intercalated graphitic and pyritic zones similar to Bulyanhulu. As the project operator, Ashanti is to earn 60 per cent interest by completing a feasibility study and arranging development funding by October 2000. Ashanti excavated trenches and pits in 1997, yielding encouraging results including 9,5 g/t Au over 12 m. A drilling programme commenced during the first quarter of 1999 and additional drilling is planned for the first half of 2000. Ownership in 2001: Tan Range Exploration Corporation 100 per cent. Newmont Overseas Exploration option to earn 70 per cent. The concession is underlain by a greenstone succession comprising banded iron formation, mafic lava flows and mafic volcaniclastics. Tuffaceous rocks have been intruded and altered by later felsic porphyry bodies to produce an extensively mineralised and silicified brecciation system. The mineralised zone is 500 m in width and at least 1,5 km in length. Tan Range carried out mapping, geophysical and geochemical surveys on the 56 km concession in 1996. In early 1998, the company completed soil sampling and IP survey programmes, and an initial diamond-drilling programme. Results returned grades of 1,76 g/t Au over 27m. A 5 000-m RAB drilling programme has commenced at Luhala. The RAB drilling will test anomalous gold in soil values which are strong and very widespread, and will also determine the extent of the mineralised silicified hill which crops out at surface. This 73-km2 prospect is situated within the Rwamagaza Greenstone Belt. It is extensively laterised, covering an extremely deformed and highly sheared suite of mafic and metasedimentary rocks. A broad northwest-south­ east-trending structural corridor hosts a series of gold­ bearing quartz reefs. Rock-chip samples from quartz veins running parallel to the reef have graded up to 32,35 g/t Au. Exploration work has demonstrated tight isoclinal folding, extending the strike potential within the licence area. In September 1998, Universal Gold was looking for a partner to fund exploration through to a bankable feasibility study. AngloGold Ltd right to earn 70 per cent The area covers 254 km2. The geology consists of banded iron formation, chert, volcanic tuffs, schists and phyllites of the Nzega Greenstone Belt. The extensive laterite cover, coupled with a regional structure, provides a strong setting for gold mineralisation. In June 1998, Universal Gold joint ventured its ground to Anglo American, which had the right to earn 70 per cent by completing a bankable feasibility study and fulfilling other obligations. Drilling was expected to begin in late 1998. Three mineral zones have been intersected on the Kanegele licence, held by the Pangea and Minieres du Nord joint venture, as the result of a second-phase drilling programme. One of these zones is interpreted to represent a shear structure, 4-7 m wide, with grades of up to 18,36 g/t Au. Another consists of several closely spaced lenses of disseminated mineralisation within a sheared corridor cross-cutting banded iron formations. At Makhona, surface-chip sampling by Ormonde Mining across a large zone of quartz veining returned a maximum grade of 8,34 g/t Au over 7 m. This outcrop lies within a zone of shearing and quartz veining exposed by artisanal pits over a strike length of at least 400 m, which contains visible gold at a number of localities. This target was to be drilled in 1999. This concession is located southeast of the Geita Mine. A soil survey identified a 3,5-km-long anomalous gold area, upon which further geophysical investigation and RAB drilling had taken place, and identified a number of anomalies. Further reverse-circulation drilling was to be carried out. In the northern part of the area, host rocks are banded iron formations, while in the central section the gold hosts are felsic volcanics and graphitic tuff. The.licence area covers 92,5 km2 and is located 25 km south-southwest of the Buhemba prospect. An area of 13 km2 was soil sampled on a 400x400-m grid for a total of 70 samples. Several anomalies above 10 ppb and ranging up to 19 ppb gold were located. Follow-up sampling in the March 1998 quarter on a 200 x 200-m grid identified several discrete anomalies up to 1 km in length and with peak values up to 54 ppb. The Mwagi Magi licence covers 32,6 km2 and is located 50 km south of the Bulyanhulu deposit. Gold mineralisation is shear hosted within metavolcanic rocks. Artisanal miners have been exploiting north-northwest-striking lodes that dip eastwards, located in the central and northem part of the licence, as well as the fold closure situated west of the licence boundary. A cross-cutting, east­ west lode has also been identified as gold bearing. The 116-km2 Mnekezi property is in the Rwamagaza Greenstone belt. Exploration at Mnekezi was underway and consisted of at least 320 RAB holes for an estimated 16 000 m of drilling. The RAB holes were to confirm the source of the anomalous gold values and pinpoint diamond-drill targets. Covering about 50 km2 , the Nyangombe prospecting licence was first explored by East Africa Mines in 1992. Since then, drilling has confirmed the presence of bedrock gold mineralisation over a strike length of 520 m, within two zones of banded iron formation. Planned work includes surface sampling and shallow drilling to test the structure along strike. SAMAX Gold Inc right to earn 60 per cent. Mineralisation has been identified in quartz veins in banded iron formations, in oxidised banded iron formation-chert units and within mafic volcanics at this prospect located about 50 km south-southwest of Lake Victoria. In 1998 the project was joint ventured to a subsidiary of SAMAX Resources. Universal Gold anticipated that 14 000 m of RAB and 5 000 m of reverse circulation/diamond drilling would be underway by June 1999. 2000. In 1997 geochemical, ground and airborne surveys were carried out, as well as geological mapping. Several targets were outlined with a few tested by limited drilling. Results included 2,85 g/t over 10 m, 2,45 g/t over 3 m and 1,57 g/t over 12 m. About 10 000 m of drilling was planned for 1998 on this 435 km2 property. Work has been delayed while Iscor obtains the necessary corporate and regulatory approvals required to assign their interests in the joint venture. Work will recommence in late 2000. SAMAX owns three licences covering 232 km2. The project area is believed to cover the extension to the Bulyanhulu deposit. The Bulyanhulu geological model is being used to develop an exploration strategy. The area has gold-bearing quartz veins. After encouraging preliminary exploration, the company planned rotary drilling and diamond drilling in 1997/98. In 1997 encouraging soil anomalies were discovered, associated with sheared volcanics and Archaean sediments. A ground-magnetic programme was completed and drilling started in late 1998. Iscor can earn a 75 per cent interest 'by spending US$5 million and completing a bankable feasibility study by 31 October 2000. Work has been delayed while Iscor obtains the necessary corporate and regulatory approvals required to assign their interests in the joint venture. Work will recommence in late 2000. Ikoka is located at the western end of the Geita Greenstone Belt and is currently being explored by Ormonde Mining. First-pass soil geochemistry has out­ lined several gold anomalies of extensive strike length in the lateritic cover which obscures the underlying greenstone and granitic rocks. Government of Tanzania 20 per cent Systematic exploration by the Australian company Maiden Gold resulted in a reverse-circulation drilling programme that confirmed the potential for a low-grade large tonnage gold deposit in the Mabale Greenstone belt. The gold appears to be associated with a northwest­ trending shear zone.The host rock consists of variably silicified and pyritised, acid to intermediate volcanics. The concession is located about 50 km west of Geita. Mineralisation occurs in an extensive shear zone. To retain the concession Tan Range Exploration had to spend US$300 000 on exploration before the end of October 1997. The property contained open-pitiable gold mineralisation over a 150-mile strike . Further drilling was planned for 1998. Ownership in 2001: Ormonde Mining PLC earning 100 per cent The Kubaisi deposit is located 4 km southeast of Nyabirama. Preliminary reconnaissance fieldwork by Ormonde Mining located significant gold values (up to 2,9 g/t) in grab samples from an old prospect consisting of sheared pyritic granite. This area covers the contact of Archaean greenstone and lower Proterozoic Bukoban sediments and volcanics intruded by an extensive magnetic dyke. The prospect consists of two reconnaissance licences covering approximately 1 452 km2. Investigations to date have indicated that the geological setting is favourable for base metals and gold. Although alluvial gold occurs in many streams which drain the extensive areas of ancient igneous and metamorphic rocks of Tanzania, economic gold deposits are mainly restricted to the greenstone belts and the Mpanda and Lupa gold areas. The Archaean greenstone belts of the Lake Victoria region of Tanzania are considered to be among the best locations in the world for the discovery and development of gold deposits. This has been ratified by the number of large corporations now seeking a position in the country through both joint venture and acquisition. The greenstone belts contain larger gold deposits than are found in most other greenstone deposits worldwide. A typical greenstone gold deposit contains about 15,5 t (0,5 Moz), but in the Lake Victoria goldfields most deposits currently being investigated are larger, ranging from 15,5-233 t Au (0,5-7,5 Moz). Acacia Mining has been operating mines in Tanzania for over 15 years. Bulyanhulu commenced commercial production in 2001 and has now produced over 3 million ounces to date. The current life of mine is currently estimated to be more than 20 years, based on its proven and probable gold reserves of 6.1 million ounces. Bulyanhulu is a narrow-vein gold mine containing gold, silver and copper mineralisation in sulphides. The mineralisation of Bulyanhulu is associated with steeply-dipping reefs. A number of distinct reefs have been identified including Reef Zero, Reef One and Reef Two. Bulyanhulu is an underground mine with shaft and ramp access, which is transitioning to long-hole as its principal mining method. The process plant currently has capacity to process an average of 3,300 tonnes of ore per day, (or c. 1.1 million tonnes per year) and around 55% of production is via doré with 45% via a gold/copper concentrate. In 2014 a 2.4 million tonnes per year carbon in leach circuit was added to the process plant to re-process tailings. Buzwagi commenced commercial production in 2009 and has produced over 1 million ounces to date. The current life of mine is estimated to be 4 years with 2 years of mining and 2 years of processing stockpiles based on proven and probable gold reserves of 0.6 million ounces. Buzwagi is a shear-hosted quartz-veined deposit, hosted in porphyritic granite. The mine is a low grade bulk deposit with a single large open pit. The process plant is designed with a throughput capacity of 12,000 tonnes of ore per day (c. 4.4 million tonnes per year) and produces both doré and copper/gold concentrate. North Mara commenced commercial production in 2002 and has produced over 2 million ounces to date. The current life of mine is estimated to be 9 years based on proven and probable gold reserves of 2 million ounces. The North Mara gold deposits are situated in the Mara Musoma greenstone belt. There are several types of gold mineralisation including shear-zone-related quartz vein and disseminated gold. The mine is a combined open pit and underground operation from two deposits, Gokona (underground) and Nyabirama (open pit). The process plant has the capacity to process an average of 8,000 tonnes of ore per day, (or c. 2.8 million tonnes per year) and produces doré. AngloGold Ashanti (NYSE:AU) operates the Geita mine, 80 kilometres south-west of the town of Mwanza. It produced 613 000 oz of gold in 2005 and proved and probable ore reserves were then estimated to be 62,4 million t at a grade of 4,23 g/t Au or 264,3 t of gold. Geita is an Archaean mesothermal, mainly banded ironstone formation (BIF)-hosted, deposit. Mineralization is found on sheared BIF-diorite contacts and in the diorite as well. At Bulyanhulu mine, the geology consists of mafic volcanic flows overlain by a series of pyroclastics and ash tuffs. Argillite is present at the contact between the mafic and felsic rocks. The gold, silver and copper mineralization on the property occurs in mineralized “reefs” or quartz veins localize along steeply dipping northwest striking structures, generally localized in the argillite units. Barrick Gold Corporation (NYSE:ABX; TSX:ABX) operated the Bulyanhulu mine, approximately 55 kilometers south of Lake Victoria and approximately 150 kilometers from the town of Mwanza. It produced 311 000 oz of gold in 2005 and proven and probable reserves were then estimated at 10,7 million oz of gold. Barrick also operates he North Mara mine, approximately 100 kilometers east of Lake Victoria and 20 kilometers south of the Kenyan border. It produced 250 000 oz of gold in 2005 from three open pits. The North Mara mine is situated within the Mara Greenstone Belt, part of the larger Lake Victoria Greenstone belt. The underlying geology comprises felsic and mafic volcanics intercalated with sediments which are intruded by various granitoid and gabbroic plutonic rocks. Tertiary volcanic lava flows partially cover the underlying Archaean geology and the ore bodies are structurally controlled, shear-hosted lode gold deposits. The Tulawaka mine is a joint venture with Northern Mining Explorations Ltd or Minieres du Nord (MDN). The mine is located approximately 1,000 kilometers from Dar es Salaam and 120 kilometers west of Barrick’s Bulyanhulu mine. The mine started producing in 2005 and Barrick's share was 87 000 oz of gold. Tulawaka gold production reached a total of 178 618 oz in 2007, compared with 139 655 oz in 2006 - a 28% production increase. In 2007, a total of 176 508 oz of gold were sold, entirely in the spot market, at an average price of $709/oz compared with an average price of $606/oz in 2006. Total revenues in 2007 were $125,1-million compared with $88,7-million in 2006, which showed an increase of 41%. The Tulawaka East gold deposit is hosted in a complex upper greenschist to amphibolite facies metamorphic terrain comprised of metasediments, including a minor component of metasilicate-iron formation and metagabbro dykes or sills. The local stratigraphy has been folded into a large-scale Z-shaped fold that plunges to the south. The anticline portion of the fold has been cut by a thrust fault sub-parallel to the south-dipping fold axial plane. Gold occurs principally as free gold within quartz veins or stockworks, often associated with felsic intrusives. In 2006, Barrick completed a positive feasibility study for Buzwagi, along with 40 per cent of the project's detailed engineering plans. It conducted 200,000 meters of exploration drilling on the property, and identified further targets. Buzwagi has proven and probable reserves of 2,64 million ounces of gold and contains 118 million pounds of copper within the gold reserves; the estimated mine life is 10 years. Its close proximity to Barrick's Bulyanhulu and Tulawaka operations brings significant synergies, including shared infrastructure, personnel, training and equipment. Buzwagi's average annual production is expected to be 240,000-250,000 ounces of gold at total cash costs of $280-290 per ounce of gold. Capital costs are expected to be approximately $400 million (excluding capitalized interest). It expected Buzwagi gold mine to be in production in 2009. Tulawaka Gold Mine ceased mining operations in March 2013 after its reserves became economically unviable for extraction and refining. Tulawaka was a combined underground and open pit gold mine. It was operated by African Barrick Gold, who owned majority shareholding of 70%. The remaining 30% belong to Northern Mining Exploration Limited. The current Tulawaka mines, owned by African Barrick Gold plc (ABG) has been handed over to Tanzania's State Mining Corporation (STAMICO). The Deputy Minister for Energy and Mining, Mr. Steven Masele confirmed to East African Business Week early June, 2013 that Tulawaka has ended up its operations and handed over to STAMICO. Asked on what the state mining corporation is going to do with the mines, Mr Masele said STAMICO would operate open cast mining. Northern Mining Explorations or Minieres du Nord (MDN) (Canadian, also active in Eritrea) has a 30% interest in the Tulawaka mine which produced 139,655 oz of gold in 2006, and is actively exploring the region surrounding the mine. Minieres du Nord (MDN), aside from its 30% interest in the Tulawaka mine, holds a controlling interest in 20 mineral licenses around Tulawaka, with four projects undergoing drilling programmes. The 102.9 km2 Viyonza Project, located 15 km north of the Tulawaka Gold Mine in Tanzania, was optioned from Tanzanian Royalty Exploration Corporation and drilling during 2007 intersected promising gold values. Resolute Mining Ltd (ASX:RSG) operates the Golden Pride mine, 750 km north-west of the port of Dar es Salaam and 200 km south of Lake Victoria. It produced 145 043 oz during the 2006 financial year and proven and probable ore reserves are 25,2 million t at a grade of 1,6 g/t Au or 1,264 million oz of gold. Resolute has outlined an additional indicated and inferred 19,4 million t at a grade of 1,7 g/t Au or 1,072 oz of gold at their Nyakafuru project. Meremeta Ltd (State) operates the Buhemba gold mine, near Musoma, planned to produce 80 000 oz of gold per year. IAMGOLD Corporation's Buckreef project is an advanced exploration project located in the Lake Victoria Goldfields of northern Tanzania. During the first half of 2007, 26,000 metres of reverse circulation drilling was completed. This program validated the continuity of a new oxide zone with a strike length of more than 400 metres that lies outside of the known resource areas. This prospective new resource will be drilled as part of the second half $2.9 million, 8,500 metre exploration plan. The current program includes regional exploration testing 7 of 20 new targets and additional detailed metallurgical studies required for a prefeasibility study. The decision to formally undertake the prefeasibility will be made by the end of 2007. WCP Resources Ltd is involved in the exploration of prospecting licences that cover three Archaean gold prospects in Tanzania. These consist of Simba Sirori Gold Project located within the southern part of the Musoma greenstone belt and is located 10 kilometres south-southwest of the North Mara Mine (3.3 million oz gold) owned by Barrick Gold Corporation in northern Tanzania; the Magamba and Siga Hills projects, subject to JV with Barrick, located 15 kilometres south of the Nyanzaga property on which Barrick and Sub-Saharan have announced a 4.5 million oz resource; and the Bukoli Project, subject to JV with Iamgold, strategically located at the southeastern end of Iamgold's Buckreef project area (Inferred Resource of 1.93 million oz gold). Tanzanian Royalty Exploration Corporation (Canadian, Amex:TRE), by mid-2005, held 138 prospecting licenses in the Lake Victoria goldfields, a large number of which are subject to royalty agreements with Barrick Gold, Anglogold-Ashanti and Northern Mining Explorations. The Company's Itetemia property is adjacent to Barrick's 12 million ounce Bulyanhulu gold mine and remains a prime candidate for the discovery of an economic mineral deposit. It has concluded an option agreement for its Luhala and Itetemia Projects with a private United Kingdom based company, Sloane Developments Ltd. Another eleven projects are the subject of royalty agreements with Montreal-based Northern Mining Explorations whose Tulawaka gold project involves a joint venture with a subsidiary of Barrick. It was announced in December 2014 that 10 million US dollars (17.22bn/-) has been closed in escrow and up to 3,642,857 common share purchase warrants for an institutional lender that will provide money to develop Buckreef gold mine project jointly owned by Tanzanian Royalty Exploration Corporation (TRX) and State Mining Corporation (Stamico). In a statement issued, TRX Chief Executive Officer, James Sinclair said the facility may be increased to 15 million US dollars (25.83bn/-) subject to financial criteria. "The company will apply the proceeds of this financing to complete the final 10 per cent of construction of the first phase of its Buckreef gold mine and to add to its working capital," the news release stated. "On the heels of our consistently successful drilling activities at Buckreef, this capital will allow TRX keep its development plan on track," said Joseph Kahama who is Chief Operating Officer of TRX. "With the many challenges facing gold companies, this is an opportune time to purchase machinery and hire skilled local workers and contractors," Mr Kahama noted. African Eagle Resources plc has defined a 520,000 ounce gold mineral resource to JORC standard, of which 71% is in the indicated category at the Miyabi gold project in the Lake Victoria Goldfield. African Eagle has begun pre-feasibility studies at Miyabi. On 3 May 2007 the company announced that had entered into a joint venture with a wholly-owned subsidiary of Randgold Resources on its 500 000 oz-plus Miyabi gold project. Under the initial option, Randgold Resources will carry out and fund an agreed phase 1 exploration programme by the end of May 2008. This programme will consist principally of a series of diamond drill hole fence lines to investigate the geology, structure and controls on mineralisation, across the width of the Miyabi corridor. Randgold Resources will then have the right to earn a 50% interest in the project by conducting and funding a prefeasibility study to agreed parameters. Following the prefeasibility study, African Eagle can retain a 49% stake in the project by cofunding a full feasibility study, or dilute to a 35% stake if Randgold Resources provides the funding in full. Oryx Mining and Exploration Ltd (former Placer Dome Ltd executives and senior geologists), a private company incorporated in Canada, holds land positions in Uganda and Tanzania. The company is also in discussions with potential joint venture partners in Guinea, Ghana and the DRC. Tanzania Gold plc is exploring the Mkurumu gold project in theTanga region. Helio Resource Corporation (Canadian, HELOF.PK, HRC.V) is exploring the Saza-Makongolosi area in the Lupa Goldfield in southern Tanzania. The block includes 4 old gold workings. The SMP Gold Project covers approximately 27km of the strike length of the Saza Shear Zone, the main gold-bearing structure in the Lupa Goldfields. Drilling in 2007 included two areas, the Kenge Target and the Kipanga Target. Kilimanjaro Mining Company Ltd is a Nevada based private company that has acquired over 40 gold licenses in the Lake Victoria Greenstone Belt area of Tanzania and 64 uranium licenses in central and southern Tanzania totaling close to 6 million acres. International Gold Mining Limited (TSX VENTURE:IGL) tenements in Northern Tanzania are located within the Tarime district of the Musoma - Mara region in the north - western part of Tanzania, some 100 kilometres east of Lake Victoria, and 20 kilometres south of the Kenyan border. The tenements acquired are located over prospective sequences within the 'Mara Greenstone Belt'. Under the terms of the Bahati Joint Venture Agreement, IGL will pay the Bahati Investment and Mining General Co. Ltd. USD$35,000 and 500,000 fully paid shares in the Company, escrowed for 12 months to earn 51% interest in the tenements. On the second anniversary IGL shall pay the vendor a further USD$45,000 to earn an extra 24% to take the Company's interest to 75%. On the third anniversary, IGL shall pay the vendor USD$50,000 to earn an extra 15% to take its interest in the tenements to 90%. The Company can at its sole discretion pay the vendor, USD$500,000 at any time during the joint venture period to gain control of 100% of the tenements. Shanta Gold Limited operates the New Luika gold mine in the Lupa Goldfields, operational and producing gold from Q3 2012, and is conducting initial exploration on projects in the Mgusu, Simba Nguru, and Musoma districts in Tanzania. The company is also involved in four other early exploration stage projects in Tanzania. Results at the Singida project for 2007, indicate a total gold resource in excess of 543,000 oz, of which 330,000 oz have been classified as a measured resource and 127,000 oz as an indicated resource. Gulf Resources Limited (ASX: GLF) signed an option agreement in November, 2007, to review the potential of jointly undertaking, with a Tanzanian partner, scoping studies with the aim of developing and financing a gold project in central Tanzania. The project is located in the Handeni and Bagamoyo district in north east Tanzania and covers some 123 km2. East Africa Metals Inc is a Vancouver-based mineral exploration company and its key asset is the Magambazi gold project in Tanzania, which was discovered by the Company in 2009. Magambazi is estimated to contain an indicated mineral resource of 15.2 million tonnes grading 1.48 grams per tonne gold and containing 721,300 ounces, as well as an inferred mineral resource estimate of 6.7 million tonnes grading 1.36 grams per tonne gold and containing 292,400 ounces. Gold was discovered by locals in the Magambazi area in 2003, spurring a gold rush with intense alluvial and hard rock mining. Canaco acquired the Handeni property in 2007 and began drilling at Magambazi in 2009. The first hole proved to be the discovery hole, returning 53 metres grading 4.32 grams per tonne gold. Further drilling in 2010 was carried out over much of the approximately 960 metre strike length of the Magambazi hill. In 2010, mineral resource drilling was initiated on section lines that were spaced 40 metres apart to define the extent and quality of the observed gold mineralisation. By April 2012, 471 diamond drill holes had been drilled for a total of 121,846 metres on the Handeni property, of which 442 holes totalling 113,692 metres were related to resource definition on Magambazi hill. Findings from approximately 400 of these holes were used as the basis for the initial mineral resource estimate announced on May 15, 2012. The remaining holes were released on July 20, 2012, and are not expected to significantly affect the mineral resource estimate. Situated in the Paleoproterozoic Usugaran/Ubendian Metamorphic Terrane, and along the northern extension of the north-trending Proterozoic Mozambique Mobile Belt, the Handeni area hosts the metamorphosed eastern extension of the Lake Victoria cratonic belt and as such is considered prospective for Archean greenstone-related orogenic lode-gold mineralization and deposits. The geology of the Handeni area is characterized by variably deformed amphibolite facies para- and ortho-gneisses, and amphibolites, with evidence for thrust faulting and the later development of a northwest trending mineralized shear zone in the northeastern portion of the property. Gold deposits on the Handeni property consist of artisanal placer deposits and orogenic vein-related mineralization in altered amphibolite gneiss. The host assemblage is interpreted to represent an original metamorphosed Archean lode-gold terrane (predominately mafic volcanic and mafic volcaniclastic rocks) that has been entrained within the Proterozoic Usugaran belt, and undergone further alteration/metamorphism during the Proterozoic Eon. A prominent east-northeast trending thrust cuts across the northern portion of the property. Additionally, mineralization in Lake Victoria is also concentrated along northwest-trending faults. Both of these features are present in the Magambazi area. Many of the significant gold deposits of the Lake Victoria area are spatially associated with iron formation; however, this relationship has not currently been noted in the Handeni area. At Handeni, artisanal alluvial placer deposits are located at Magambazi, Magambazi North, Kwadijava South, Kwadijava, and Majiri. At Magambazi, Magambazi North, and Kwadijava, artisanal workings occur in quartz-vein-related gold, with mineralization located within silica and garnet altered amphibolite gneiss. Garnet in these altered sections is generally fine grained (<2 millimetres) and the altered zones typically display only a vague banding texture as compared to associated gneisses. The depth extent of these mineralized systems has been confirmed by diamond drilling. The gold mineralization exposed at Magambazi through mapping and drilling has significance with respect to establishing a deposit model that can be applied to exploration in the region and potentially as a deposit with extensions that project onto the Handeni property. Field observations indicate the Magambazi prospect contains numerous significant bedrock artisanal workings that are located on the western flank of an 11 kilometre long geochemical anomaly. Local miners are exploiting gold mineralization within steeply dipping, north-northwesterly-trending occurrences of sulphide and quartz veins. From surface, mineralized occurrences are being mined by artisans over widths up to 10 metres, and these define a north-northwesterly trend with a total strike length of 350 metres. Drilling has confirmed that this mineralization continues at depth, and is traceable laterally beyond the known surface extents of mineralized showings for a distance of 960 metres. Mineralization is characterized as vein-related structurally controlled orogenic gold associated with pyrrhotite, arsenopyrite (löllingite), trace amounts of galena and chalcopyrite, and locally graphite. The immediate host rocks are garnet-silica altered amphibolite, enclosed within a sequence of interbedded paragneiss and amphibolite. Multiple mineralized intercepts have been encountered, and two main types of gold mineralization are observed from diamond drilling at Magambazi: high-grade gold associated with pervasive silicification on the postulated footwall of the main Magambazi Fault, termed the Magambazi Lode (D. Groves, 2012); and low-grade gold in an apparent stratabound relationship occurring to the west of this fault. Structurally, two major steep faults trend northwest along the orientation of the mineralized system, although the nature of the rock in the main mineralized zones is competent their actual fault plane is difficult to definitively identify. The alteration and later metamorphism appear to have annealed the areas of significant mineralization. This, and the decrease in pronounced compositional banding, suggests a high-grade metamorphic overprint of an originally lower metamorphic-grade orogenic gold deposit. At depth, mineralization trends at Magambazi and Magambazi North are similar in a northwest orientation, but vary in dip and plunge direction. At Magambazi, mineralization dips steeply to moderately west, and plunges northwest. In contrast, mineralization at Magambazi North dips moderately to gently east, and plunges southeast. 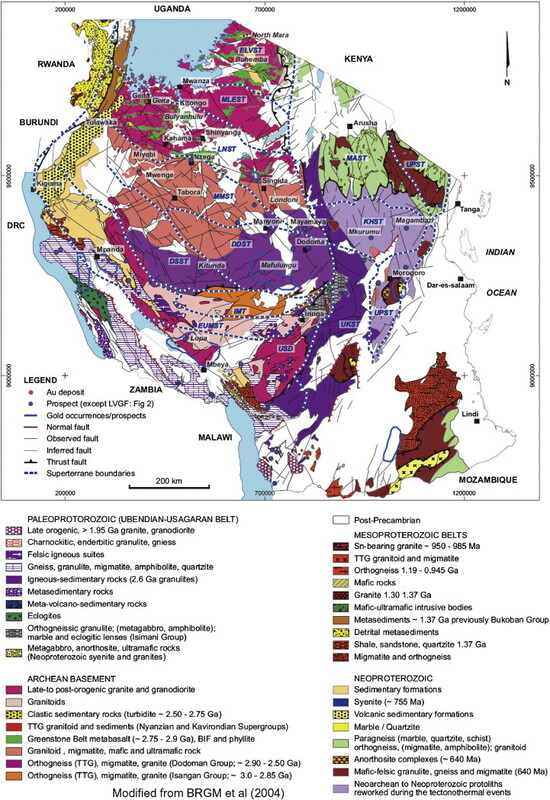 The fact that the Magambazi North mineralized zone dips in a direction opposite to that of the interpreted main foliation, while also paralleling the trend, suggests the primary depositional environment hosting gold mineralization likely predated the last major compressive tectonic event. In December 2011 Canaco commissioned an initial mineral resource estimate for the mineralized portion of the Magambazi area. The results of this work were announced on May 15, 2012, reporting an initial mineral resource estimate of 15.2 million tonnes grading 1.48 grams per tonne gold and containing 721,300 ounces in the indicated category, as well as 6.7 million tonnes grading 1.36 grams per tonne gold and containing 292,400 ounces in the inferred category. Tanzania Minerals Corporation (TZM) has focused its exploration efforts in the Lake Victoria Goldfield, Musoma District and has 100% ownership of three key concessions in this area that are currently being developed. The Mrangi Project is the most advanced at the current time, as TZM has been actively working on Phase 1 of it's exploration plan on this concession . Katario (Mrangi East) and Kibara (Mrangi South) have recently been acquired as they are in close proximity to the Mrangi Project. Kibo Mining plc is an Irish registered company established in 2008 to focus on exploration and development of gold and nickel deposits in Tanzania. Its shares are quoted on the Alternative Investment Market (AIM) of the London Stock Exchange and on the AltX board of the JSE in South Africa. Its projects are located both in the established and gold prolific Lake Victoria Goldfields, the emerging goldfields of eastern Tanzania and the Mtwara Corridor in southern Tanzania where the Government has prioritised infrastructural development attracting significant recent investment in coal and uranium. Kibaran Nickel Limited (ASX: KNL) has reported the discovery of large flake graphite from its Mahenge Graphite Project in Tanzania. In May 2012, Kibaran Nickel acquired Tanzgraphite, which owned the Mahenge and Merelani-Arusha graphite projects in Tanzania. The Mahenge project hosts the Ndololo, Epanko and Kasita graphite prospects and consists of two tenements covering an area of 325.5 square kilometers. Drilling at the Mahenge and Merelani-Arusha graphite prospects expected to begin in mid-July 2012. Geological mapping at Ndololo prospect delineated the graphitic schist to occur over at 17.4 kilometer strike length -- three times larger than historically recorded at 5.0 kilometers. Large flake graphite up to 9 millimeters in diameter is continuous along the strike length. An additional graphitic schist occurs over a 13.6 kilometer strike length at the Kasita and Epanko prospects. The Merelani-Arusha graphite project consist of 7 tenements covering 973.4 square kilometers and flake graphite of up to 10 millimeters in diameter has been observed. Geological mapping has observed a graphitic schist of over 1.5 kilometers in length with an average width of 200 meters. Previous work carried out by Tanzgraphite’s geologists and available technical data provides information to estimate a potential exploration target of between 3.5 million tonnes and 7 million tonnes of graphitic schist grading between 10% and 15.5% Carbon for the Ndololo graphite project. Metallurgical study data as well as sample preparation was underway for MOU partners and potential end users. Magnis Resources is a near-term graphite producer whose Nachu project is located in Tanzania. In March 2016, the company released a bankable feasibility study for the project. The company has focused on planning out infrastructure, including road upgrades, engineering for a water storage dam and a village relocation project. On 1 February 2016, Magnis declared an updated Mineral Resource Estimate for the Nachu Graphite Project. The global Mineral Resource Estimate comprises 174 Million Tonnes (Mt) at an estimated grade of 5.4% Graphitic Carbon (Cg) and is reported in accordance with the 2012 Edition of the Australasian Code for Reporting of Exploration Results, Mineral Resources and Ore Reserves (JORC Code, 2012). Volt Resources, formerly known as Mozambi Resources, is focused on the exploration and development of its wholly owned Namangale graphite project in Tanzania. A prefeasibility study for the project calls for annual output of 170,000 tonnes of graphite concentrate; Volt is currently working on completing a definitive feasibility study for Namangale. Maiden JORC Ore Reserve for the Bunyu graphite project is 127Mt @ 4.4% TGC. The total resource (Measured, Indicated and Inferred) of 461Mt at 4.9% TGC has been estimated to JORC 2012 reporting guidelines for the combined Bunyu North (Bunyu 1) and Bunyu South (Bunyu 2 and 3) resource. Walkabout Resources is exploring for both coal (in Botswana) and graphite, and holds the Lindi graphite project in Southeastern Tanzania. In Q2 2017, Tanzania’s National Environmental Management Council issued an environmental certificate for the project; it will allow Walkabout to finalize its mining license application. Walkabout declared a global Mineral Resource of 29.8 million tonnes (Mt) at an estimated grade of 10.9 % Total Graphitic Carbon (TGC), and is reported in accordance to the 2012 JORC code. The high grade Measured, Indicated and Inferred Mineral Resource contains a super high grade core of 4.7 million tonnes at 22.8% TGC for 1,076,500 tonnes of contained graphite making this the highest mineable graphite resource in Tanzania. The Ore Reserve has resulted in a Life of Mine of approximately 20 years to produce 40,000 tonnes of graphite concentrate per annum. Walkabout also has a prospecting license for its Kimoingan graphite project in Northeastern Tanzania. The Kabanga deposits are hosted in small mafic-ultramafic intrusives that are part of the Meso-Proterozoic Kibaran Orogenic Belt of Central Africa. Mineralization comprises pentlandite, chalcopyrite and pyrrhotite ranging from net textured to massive sulphide. The Luwumbu area contains a number of mafic and ultramafic intrusions in a zone that is at least 160km in length. This area of Southwest Tanzania has the most extensive outcrop of rocks interpreted to form part of the same geological province as the host rocks to the Kabanga nickel deposits in the northwest of the country. The Kabanga nickel deposit was discovered by the United Nations during the 1970s following a comprehensive geochemical and geophysical program that identified a chain of coincident airborne magnetic and geochemical anomalies within a 20-30 kilometre wide northeasterly trending belt that extends for over 200 kilometres from Burundi in the south, through western Tanzania, to Uganda in the north.The Nachingwea prospect is situated within the Proterozoic age Mozambique Belt to the southeast of the Archean Tanzanian craton and is underlain by a heterogeneous assemblage of mafic to felsic granulites and gneisses, amphibolites, sedimentary rocks and ultramafic to felsic intrusives. All lithologies have been complexly deformed and metamorphosed to amphibolite and granulite grade. Nickel sulphide mineralization is associated with pyroxenitic ultramafic rocks and the sulphides occur as both disseminations and blebs within the intrusions as well as massive remobilized veins. The high nickel grade massive sulphides consist primarily of pyrrhotite and coarse grained pentlandite with subordinate chalcopyrite and minor magnetite. In 2005, Falconbridge acquired a 50% indirect interest in the Kabanga nickel project in Tanzania from Barrick, which retains the remainder. Falconbridge is the operator of the joint venture. 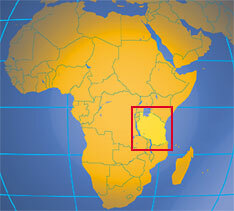 The project is located in northwestern Tanzania, south of Lake Victoria and near the Burundi and Rwanda borders. The current estimated inferred resource is 26,4 million tonnes grading 2,6% nickel based on estimates released by Barrick (February 2003). Xstrata Nickel, a subisidiary of the London-listed mining firm, said in February, 2007, it would spend $95m completing a prefeasbility study of Kabanga nickel. Xstrata also said Kabanga had an estimated indicated resource of 9,7 million tonnes of nickel grading at 2,37% nickel and a total estimated inferred resource of 36,3 million tonnes grading 2,8% nickel. African Eagle Resoueces plc has bee exploring the Dutwa nickel deposit. The deposit lies in the Kilimafedha belt (Swahili for "money hills") of the Lake Victoria Goldfield. Greenstones and granites underlie the area. The greenstones, of Archaean Nyanzian age, are mostly metamorphosed volcanic and sedimentary rocks, with some banded iron formation in the east. Several large ultramafic bodies intrude the greenstones, the nickel laterites form a blanket up to 80m thick on top of these. To investigate the main nickel anomaly, African Eagle undertook trial drilling in June 2008. The results were very encouraging and a 139 hole reverse circulation (RC) drilling programme was completed to delineate the resource. The Company also undertook a 10 hole diamond drill programme to obtain core samples for metallurgical testing and density measurements. From the results of this drilling independent consultants SRK Consulting (UK) Ltd estimated a maiden JORC inferred mineral resource in November 2008. The Dutwa nickel oxide project consists of two hilltop deposits, Wamangola and Ngasamo, which form thick residual lateritic caps on the tops of low ridges 7km apart. Combined the two deposits have a JORC Indicated and Inferred resource of around 100Mt at circa 1% nickel. 94% is in the Indicated category with the ferruginous siliceous ore ("FeSi") comprising 70% of the total resource. As announced on 12 September 2012, the Wamangola FeSi ore is strongly amenable to beneficiation and demonstrates improved leach characteristics compared to run-of-mine ore.
Castillian Resources Corporation has acquired a 100% interest in four properties in the Kagera Belt, Tanzania. The key claims are approximately 10 km northeast of the Kabanga nickel deposits of Xstrata/Barrick. Mapping indicates a 20 km long belt of prospective mafic and ultramafic rocks on trend with the Kabanga deposits. Albidon Ltd is involved in the the Luwumbu Project, situated in the Livingstone Mountains of southwestern Tanzania, which is owned 90% by Goldstream Mining NL and 10% by Albidon. In June 2003 an agreement was signed whereby Lonmin plc may earn a 70% interest in the project by sole funding a Feasibility Study on an Indicated Mineral Resource. The Songea Project comprises five Prospecting Licences in SW Tanzania covering an area of 4,093 sq km, and is part of the Albidon-BHP Billiton Africa Exploration Cooperation Agreement. Published geological maps indicate that rocks in the Songea Project are similar to those on the Luwumbu Project, along strike to the north, where significant platinum mineralization has been identified. Goldstream Mining NL is exploring the Nachingwea Project (Goldstream 100%) which consists of four granted tenements totaling 7,300 square kilometers, located in south eastern Tanzania. Follow up of historic drainage anomalies has located two ultramafic trends. Orientation soil sampling over the ‘Nditi’ pyroxenite returned highly anomalous values of 6,932ppm Cu, 7,760ppm Ni and 1,2g/t PGE. The body appears to extend over 5 by 2 km. The company has announced announced plans to divest its Nachingwea nickel-copper project in a $12 million to $17 million initial public offer on the Toronto Stock Exchange. The ASX listed Goldstream will spin-off its Continental Nickel Ltd subsidiary, but will maintain a 51 per cent stake in the company, as well as a 25 per cent free carry through to the completion of a feasibility study or until CNI incurs a minimum level of expenditure. Continental will also have the right to acquire further nickel projects, with at least $8.6 million in IPO proceeds being committed to proposed exploration of the site. Continental Nickel Ltd is now exploring the Nachingwea Project. The project is 70:30 joint venture between Continental Nickel and Goldstream Mining NL and Continental is the project operator. The land holding comprises 17 granted prospecting licences totalling 3,199 sq km with an additional 25 licence applications totalling 4,814 sq km pending. During the period 2004 to 2006, Goldstream carried out field programs on the Nachingwea property comprising surface sampling, a small VTEM survey, ground geophysics and drilling (17 holes totaling 2,153 m). This work culminated in a significant new greenfields nickel sulphide discovery in June 2006 when drillhole NAD13 intersected 11.23% Ni, 1.74% Cu and 0.15% Co over 3.0m including 15.87% Ni, 2.61% Cu, 0.21% Co, 0.49 g/t Pt and 0.32 g/t Pd over 1.68m. This mineralization was intersected at a vertical depth of 65m at the contact between ultramafic and metasedimentary lithologies. Eleven other holes returned significant (>0.5%) nickel values from the mineralized intercepts over core widths of 0.5 to 23.0 m. Previous work by other companies included mapping, trenching and drilling (6 holes totaling 1,302m) by INCO during the period 1950-1953 and a regional magnetic/radiometric airborne survey and stream/soil sediment sampling by BHP between 1996 and 1998. Tanzanian Royalty Exploration Corporation holds seven prospecting licenses representing a combined area of4,434 square kilometers within the Kabanga nickel belt. Kibo Mining plc's Haneti Nickel Project is a joint venture with Brazilian industrial conglomerate, Votorantim. Priority focus is on those localities with elevated nickel (up to 13%) and PGMs (up to 2.3 g/t combined Pt & Pd) within the nickel-PGM-copper prospective Haneti-Itiso Ultramafic Belt identified from the Company’s previous work on the project. Extension of soil sampling and ground geophysical grids around these localities are in progress to further resolve existing drill targets and to generate others; also regional exploration comprising geological mapping, soil sampling and stream sampling to target both nickel sulphide and gold mineralisation; as well as diamond drilling on geochemical and geophysical targets at the Mihanza, Mwaka,Kwahemu and Sanato Hills localities. A 1,000m diamond drilling programme is planned over these localities toward the end of 2013 or early in 2014. • Tanzania is expected to become one of the fastest-growing economies in the world, with recent natural gas discoveries being a key driver. • Exploration activity continues to reveal big offshore gas discoveries. • LNG exports are expected from 2020. • A 542-km pipeline from Mtwara to Dar es Salaam is to be completed by December 2014. It will allow power generation by natural gas to increase from around 40% to 80% of total supply. • Statoil and Exxon Mobil announced in June 2014 that the sixth well drilled in Block 2 also encountered gas, increasing the estimated reserves for the two companies from around 17 to 20Tcf. • Forbes noted that the Tangawizi discovery of 4-6Tcf was the sixth-largest global oil & gas discovery in 2013. • There were only five bids on four of the eight blocks offered in the May 2014 bidding round. The lack of interest could be due to limited data on certain blocks or stricter licensing terms. • The BG and Statoil consortiums, with offshore Blocks 1, 2, 3 and 4, have indicated that two onshore 10-million tonnes/year LNG plants could be required in Tanzania, but these will only be operational in 2020. • The Ophir and BG consortium, with offshore Blocks 1, 3 and 4, has estimated the reserves to be around 15Tcf. Ophir’s sale of 20% of its assets in Blocks 1, 3 and 4 for USD1.3 billion to Pavilion Energy netted the Government USD258 million in capital gains taxes. • Offshore blocks drilled for the first time: In 2013, Ophir drilled its first well in Block 7, but no hydrocarbons were encountered. In 2014, Shell will drill its first well in Block 6. Tanzania has been intermittently explored over the last 50 years with most multinational petroleum companies being present, at one time or another. So far only 35 exploration and development wells have been drilled in 280,000 square kilometres of hydrocarbon potential sedimentary basins. Since 1980, foreign oil prospectors have invested more than $293 million searching for oil in Tanzania without success. The government in Dar es Salaam continues to encourage oil exploration in the country, through the Tanzania Petroleum Development Corporation (TPDC), seeing oil as a key to economic development. Experts have long suspected that there are considerable hydrocarbon reserves off Tanzania's coast. A second licensing round, since 2000, covering deepwater acreage to the north of Dar es Salaam was concluded in August 2002, calling for bids on 12 blocks. Bids were received from only two companies, Shell and Global Resources, both interested in blocks 9-12. In October 2002, exploration rights were granted to Shell for all four blocks. Shell conducted 2D seismic surveys of the areas, and will use the results to conduct 3D seismic surveys. Royal Dutch/Shell hoped to begin exploration in 2004 on its four deep-water blocks. 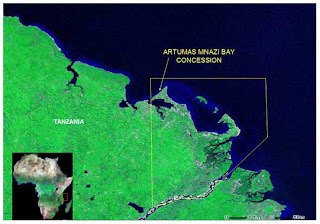 Artumas Group Inc operates the Mnazi Bay Concession. The Mnazi Bay exploration and production concession covers a 756 sq. km area in south eastern Tanzania, bordering Mozambique to the south and lying along the north eastern flank of the Rovuma River. In 1981, AGIP (now ENI) drilled a shallow water, off-shore well and discovered the Mnazi Bay Gas Field. However, due to a lack of a commercial gas market at the time, AGIP capped the well, leaving the wellbore integrity intact, and relinquished the concession. In 2004, Artumas acquired the rights to the Mnazi Bay concession. With no signature bonus requirement, the Company committed to provide a gas-to-power energy solution for the Mtwara/Lindi region to replace their existing unreliable, aging system. This has become known as the Mtwara Energy Project. New seismic data and interpretation indicates the Mnazi Bay Gas Field to be more than double the size of original estimates, covering some 75 square kilometers in aerial extent versus the original estimate of 34 square kilometres. Tullow Oil plc has agreed a farm-in deal with Ndovu Resources Limited, a subsidiary of Aminex plc, which involves the company earning a 50% interest in two licences in the Tanzanian portion of the Ruvuma Basin. Tullow will be appointed Operator upon completion of the farm-in commitment and will provide technical support during the seismic acquisition programme. The farm-in deal and subsequent change of operatorship are subject to formal approval from the Tanzanian government. The acreage involved lies approximately 500 km south of Dar es Salaam, along the Mozambique border and comprises the Mtwara and Lindi licences which cover a total area of 12,361 sq km. The licences are adjacent to the Mnazi Bay gas field, discovered in the 1980's and currently under development. The area was last explored in the 1980's and prior to recent activity less than 1,400 km of 2D seismic had been recorded. Numerous leads have been identified by previous operators from this data, many with significant potential. Initial targets will be Tertiary and Cretaceous reservoirs. Oil seeps are known in the area. Aminex plc is exploring the Nyuni and Ruvuma licence areas. The Nyuni-1 well was drilled to nearly 4,000 metres during 2003/4 and encountered numerous oil and gas shows in a thick but complex reservoir sequence. The well did not flow commercial quantities of oil and gas under limited test but established the presence of live crude oil from a wide-ranging Jurassic source, opening up the prospectivity of the whole region. 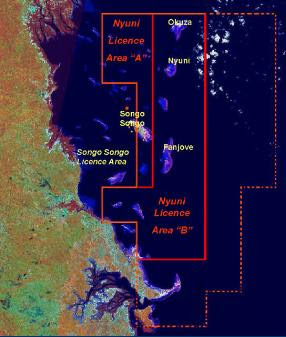 In the period 2005-7 new marine 2D seismic and transition zone 2D seismic was acquired over the Nyuni licence. In 2007 Aminex farmed out interests to Key Petroleum Ltd. (20%) and to RAK Gas Commission (25%). In addition East Africa Exploration Ltd. earned a 10% interest through contributing new seismic valued at $2 million. An earlier provisional farm-out to East Coast Energy Ltd. was never finalised. In April 2006 Aminex signed a contract with Caroil of France for the use of the Caroil-6 drilling rig to drill two wells on the Nyuni licence. Mechanical delays with this rig have delayed first spud date until Q4 2007. In late 2005, Aminex finalised a PSA for the Ruvuma onshore/offshore area in South Tanzania covering 12,000 sq km. Before end 2005 Aminex had acquired 500km of new seismic in the offshore part of the licence. Onshore seismic is being acquired over Ruvuma during 2007 and a first well location selected with planned drilling in 2008. 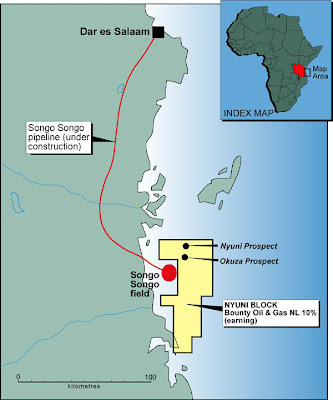 Bounty Oil & Gas NL has a 10% share (Aminex-60%, Petrom SA, the state oil company of Romania-30%) of the Nyuni Block of 2860 km2, located just off the coast of Tanzania, 200 kms south of Dar es Salaam. Adjacent to the permit is the Songo Songo gas field, which contains 590 Bcf (proved and probable) of recoverable gas. The proven reserves are contracted to the Ubungo Power Plant. A 12-inch diameter pipeline capable of transporting 105 mmcfgd (uncompressed) from the field to shore has been completed and a 16-inch 120 mmcfgd pipeline up to Dar-Es-Salaam is under construction and due for completion in May 2004. In May 2005, the Tanzania Petroleum Development Corporation (TPDC) offered Ophir Energy (U.K.) , Statoil ( Norway ) and Petrobras ( Brazil ) production sharing agreements (PSAs). In October 2005, Ophir Energy signed the PSA for Block One, while Statoil and Petrobras are still negotiating contracts for their PSAs. In 2004, TPDC signed with Petrobras for deepwater Block Five, off Mafia Island and with Maurel & Prom (France) for acreage along the coast. Shell has yet to finalize an agreement for Blocks 9 - 12 near Zanzibar and Pemba Islands, which it won over two years ago. Dodsal Hydrocarbons and Power (Tanzania) Pvt. Ltd. (a wholly owned subsidiary of Dodsal Resources) signed a Production Sharing Agreement with Ministry of Energy and Minerals and Tanzania Petroleum Development Corporation for exploration of oil and gas for the RUVU block which is approximately 15,300 square Kilometers. Discussions are ongoing between government and Petrobras of Brazil for oil and gas exploration in the deep waters of Block No 8 and Tullow Oil of UK for exploration in Northern Lake Tanganyika. Peak Resources Ltd is developing the Ngualla Rare Earth Project in Tanzania is a recent discovery and is the highest grade of the large undeveloped rare earth deposits. Fundamental geological aspects offer distinct advantages for development over other rare earth projects. These include the large size of the deposit, outcropping, high grade mineralisation amenable to open cut mining with low strip ratios, favourable mineralogy amenable to a relatively simple, low cost processing route and extremely low uranium and thorium levels. Located in southern Tanzania 147 kilometres from the city of Mbeya on the edge of the East African Rift Valley, Peak’s Ngualla Project is centred on the Ngualla Carbonatite. The maiden Ore Reserve estimate for the Ngualla Project was announced on the 19th March 2014 and is 20.7 million tonnes at 4.54% REO (total rare earth oxide plus yttrium). 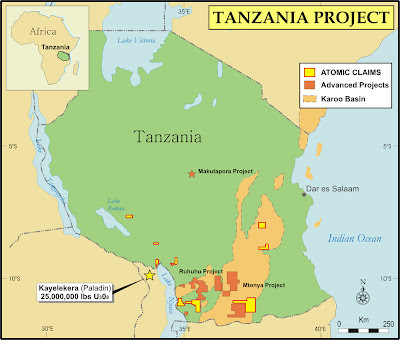 The uranium potential of Tanzania was established by government surveys in the late seventies. Follow-up work on some of the numerous anomalies generated, led to the discovery of two deposits of ‘roll-front’ style mineralisation in Karoo sediments. These deposits are now largely contained within the Selous Game Reserve. There has been little to no exploration for uranium in Tanzania since the early eighties. Mantra Tanzania Limited will soon begin uranium extraction at its Mkuju River project after it received an environmental impact assessment certificate, Tanzania's The Guardian reported on Saturday June 8 2013. Through local and foreign experts, the government has taken measures to ensure there is no environmental harm from mining activities, said Minister for Energy and Minerals Sospeter Muhongo. Mantra will drill for uranium during the dry season so that lorries can travel on dry roads, Mantra Executive Director Asa Mwaipopo said. The Mkuju River project is expected to attract $1 billion (1.6 trillion shillings) of foreign direct investment to Tanzania over the life of the mine, and to generate some $640 million (1 billion shillings) in direct and indirect cash flows. European Union Ambassador Filiberto Ceriani Sebregondi has said the EU will work with the Tanzanian government to ensure uranium extraction is properly conducted. Douglas Lake Minerals Inc. announced it has successfully acquired four Tanzanian uranium properties that cover an area of approximately 500 square kilometres. Two of the properties are located in Northern Tanzania in the Babati region. Initial reports provided by DLKM's geological consultants, Geosource Explorer, have determined that these two deposits are 'surficial'. The other two properties are located in the Njombe District in southern Tanzania. Initial reports by Geosource Explorer indicate the southern deposit geology is similar to that of the Rössing Deposit in Namibia. Goldstream Mining NL. Four new tenements covering a total area of 1,885km2 have been offered to Goldstream by the Tanzanian Ministry of Energy and Minerals. Historic drill intercept of up to 2,3 kg/t U308 in a ‘calcrete’ environment, occur on the company’s Bahi tenements in Central Tanzania. Drainage geochemical surveys conducted by Goldstream over its tenements in Southern Tanzania have identified anomalous coincident uranium and lead anomalies. Uranium Resources plc (AIM:URA) has acquired four uranium prospecting licences, covering an area of approximately 2,500 km2. The area has promising geology with the German company Uranerzbergbau GmbH identifying the area as prospective for uranium during reconnaissance exploration between 1978 and 1982. 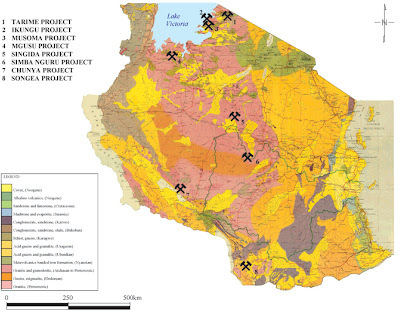 Three of the licences are located in the Mkuju River area in southern Tanzania, an area recognised by Uranerz as one of the two most important uranium targets in Tanzania. The fourth licence, the Makutapora prospect in Central Tanzania, targets uranium in calcrete. Western Metals Limited has entered into a farm-in agreement with Uranium Resources. Uranium Hunter Corporation has an agreement with Trimark Explorations, on behalf of its wholly owned subsidiary Gambaro Resources, to earn up to a 100% interest in a gold/uranium property located in Njombe and Songea Districts, Tanzania. International Gold Mining Limited (TSX VENTURE:IGL) has joint ventured into two tenements at Bahi Swamp, consisting of one granted prospecting licence, and one application, totalling 1,821 square kilometres of ground. The Bahi Swamp catchment area is a dry lake covering over 1,000 sq km, and incorporates an extensive closed drainage system that has developed over 27,000 sq km of weathered Archaean granites. Uranium accumulation within the Bahi catchment system has been recognised since the 1950's when uranium mineralisation was first intersected in a drill hole located near the centre of Bahi Swamp. Recent positive exploration results announced by Uranex NL from the Bahi 'C1' prospect have reconfirmed the potential of the Bahi Swamp catchment area to host significant calcrete / playa, as well as roll front style uranium deposits. The two tenements abut the western boundary of Uranex NL (UNX-ASX) project with assays from vertical channel samples reported to include 1.5m @ 2.4kg/t U3O8, 2.75m @ 1.33kg/t U3O8, and 2.0m @ 1.4kg/t U3O8. The Company has also entered into a joint venture over a granted prospecting licence covering an area of 43 sq km at Singida, considered prospective for gold, uranium and diamonds. Western Metals Limited (ASX: WMT) is drilling the Mtonya Project, with high grade uranium over a strike length of 4 km and announced the discovery of two new uranium prospects within its Tanzania exploration area. Surveys from the regional helicopter supported field reconnaissance programme carried out in November 2007, has resulted in the discovery of two new important mineralized systems, Foxy and Eland, in the Ruvuma project area. The prospects are located approximately 60 km south-east and 110 km south-west of Mtonya respectively. Foxy Prospect - mineralisation at Foxy is related to a hematised sandstone bed exposed over an area of approximately 0.5km2. Counts up to 20,000 counts per second (cps) were found in association with the abundant yellow secondary uranium mineral, uranophane. A grab sample taken from the eastern edge of the anomaly returned an assay result of 13,400 parts per million (ppm) U3O8. Eland Prospect - mineralisation is associated with a banded, leuco gneiss. WMT geologists located an anomalous area of approximately 0.6km2 with hotspots up of up to 4,000cps. Grab samples collected from the area returned assay results of 141ppm U3O8, 440ppm U3O8 and 1,080ppm U3O8. The discovery of a new type of uranium mineralisation in basement rock in SW Tanzania is extremely encouraging. The potential presence of this type of mineralisation opens up a number of possibilities and warrants the re-evaluation of a number of highly significant airborne radiometric anomalies that were previously downgraded and dismissed as anomalous basement. Atomic Minerals Ltd has signed a letter of intent with Geo Can Resources Company Ltd. to acquire up to a 90% interest in over 2800 sq. kilometers of potential uranium enrichment in southwestern Tanzania. It is located in the same region as properties held by Paladin Resources (Malawi), Denison Mines and Western Metals.